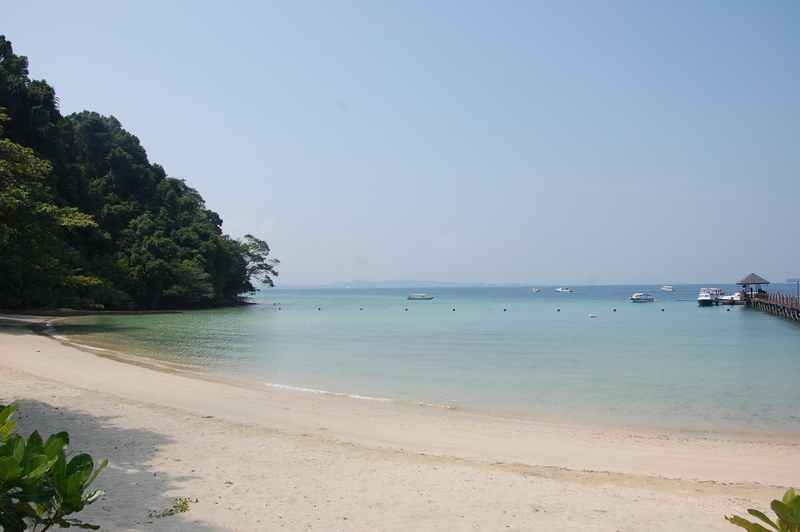 After our time in Borneo, we were ready for some chilled out beach time and that is exactly what we got. Because it was currently typhoon season in The Philippines, we had to choose our destination carefully. 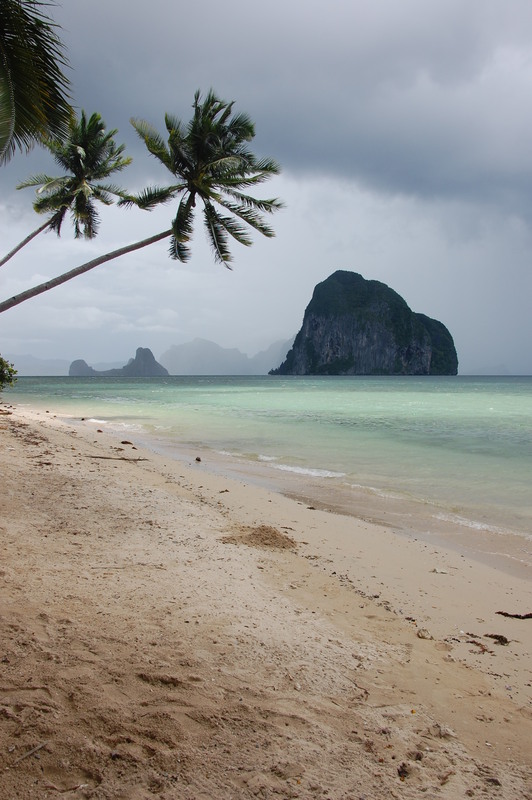 We decided on the large island of Palawan which sits in an area that normally does not see too much rain this time of year. After a flight into Manila, we flew on to Puerto Princesa, the biggest city in Palawan. It was not a place you really want to hang out for too long so after one night, we traveled to our first destination of Sabang. 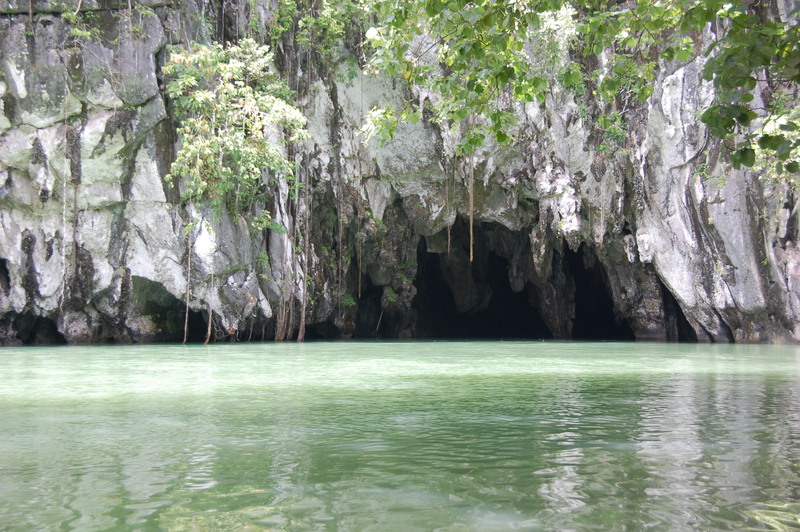 Anyone who comes to Palawan is heading to Sabang to visit the underground river. An amazing cave system has been created with a freshwater river flowing into the ocean. The best way to view the caves is by taking a boat ride up river through the inside. 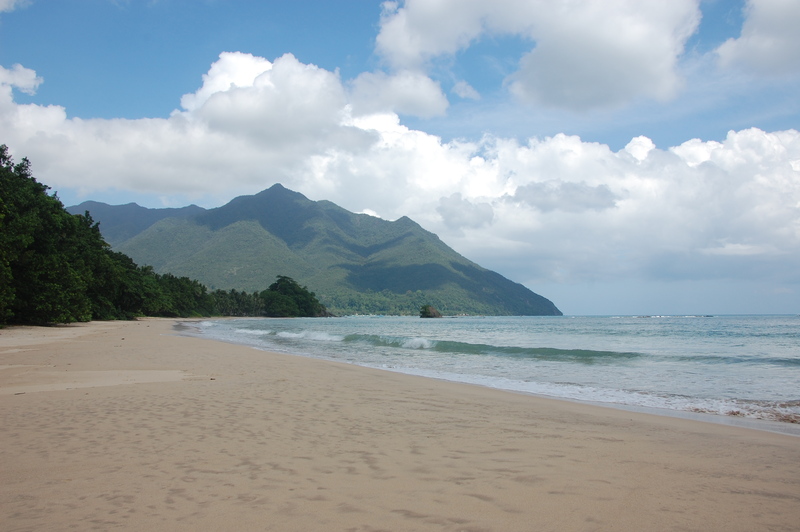 Upon arriving in Sabang, we were very pleasantly surprised to realize that besides the underground river, there was also a beautiful beach to hang out at. Most people only come and visit the river during the day so around sunset, the beach cleared out and it felt like our own little island paradise. We were only planning on staying for two nights, but with its relaxed vibe and spectacular beach, we kept extending our stay. After five nights in Sabang and a quick trip to the underground river, we found some travellers to share a boat to a private island which was home to the Coconut Island Beach Resort. The morning we left on the boat, the clouds rolled in and it looked like a storm might begin. 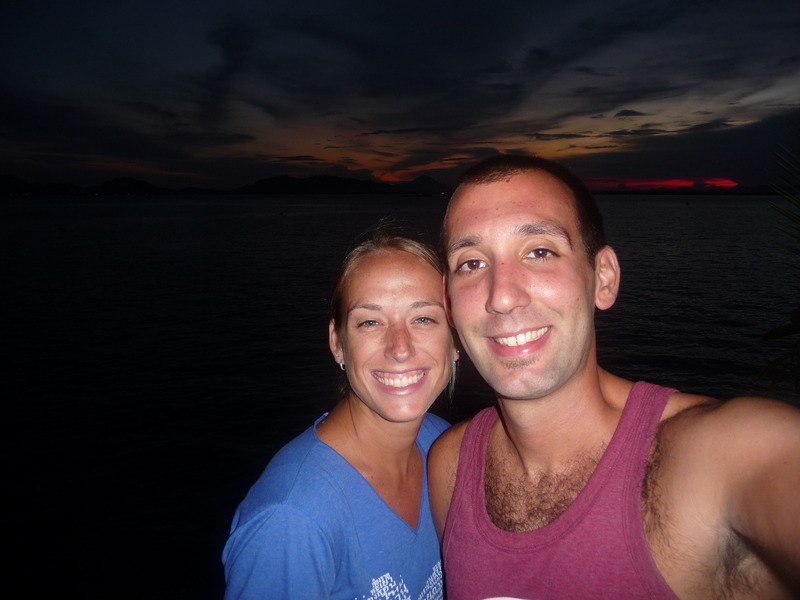 Neither of us really thought much of it until we got on our tiny banka (boat) and started getting out on the ocean. The huge swells and white caps not only got us (and all of our bags) soaking wet, they almost tipped over our rickety boat. We thought for sure that we were going over and would have to swim to shore. Three hours later, we were so thankful to pull around and see the resort up ahead. The boat ride had been one of the scariest rides we have had on this trip! 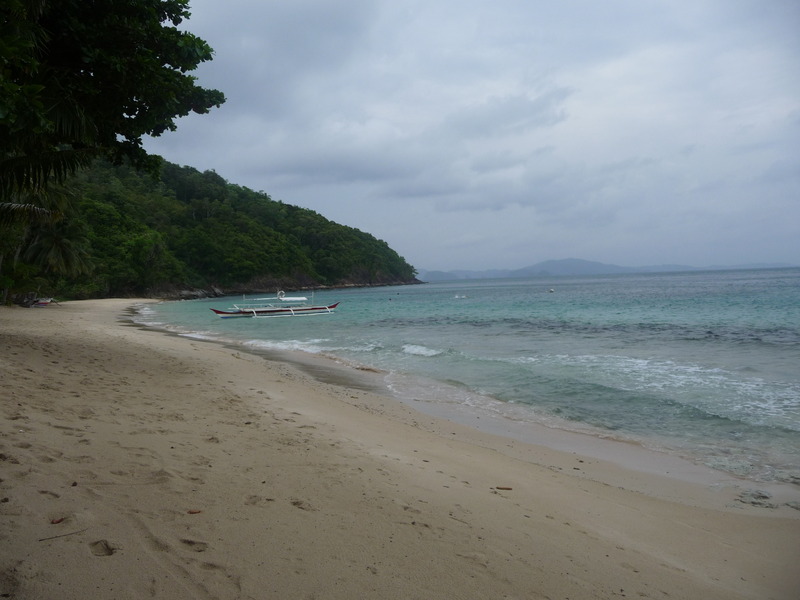 Unfortunately, several days of rain followed and the resort quickly cleared out with people heading back to the mainland of Palawan. We decided to stay one extra day and got lucky with sunny weather. We ended up being the only people still at the resort so we had the entire island and beach to ourselves! It was a fantastic place to hang out once the weather cleared up. Moving on from Coconut Garden, we took another boat (this one was much more sturdy!) to the nearest city of Port Barton. More beach time and more beautiful sunsets, we spent several days here before moving onto our final destination of El Nido. 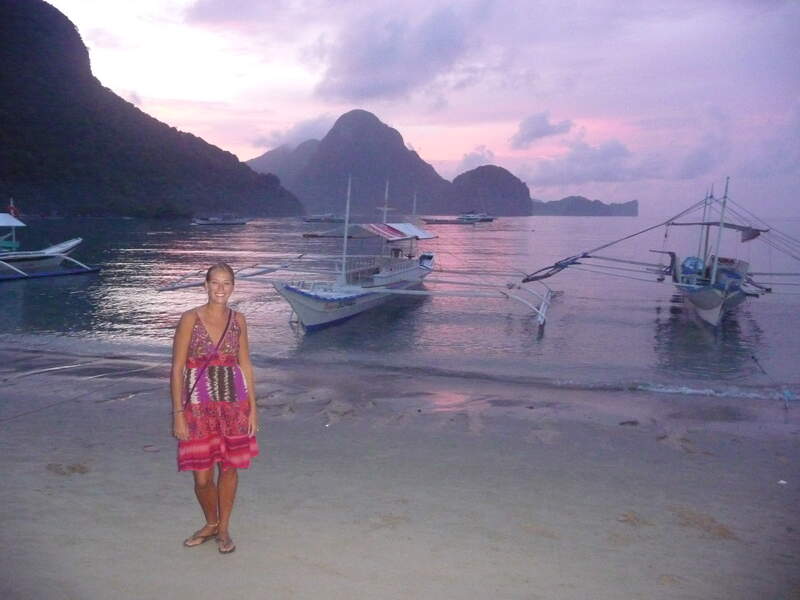 El Nido is also a place that is on everyone’s list who comes to Palawan. 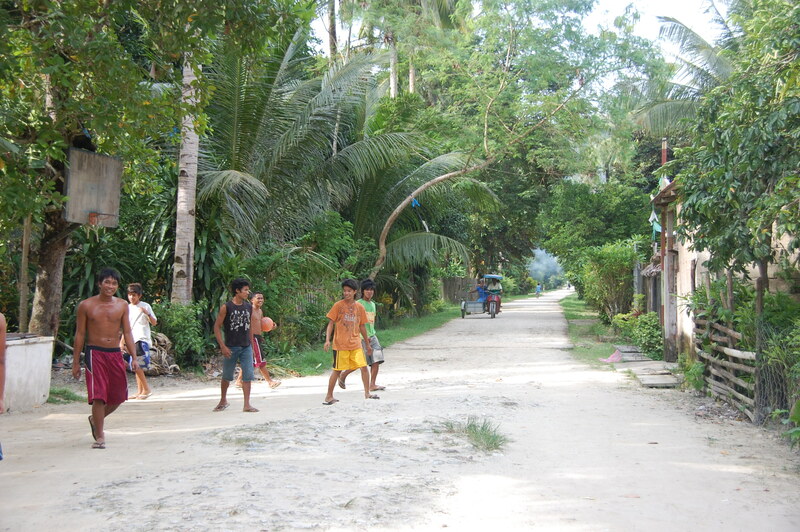 In the northern part of the island, the sleepy fishing town is always busy with tourists coming to explore the surrounding Bacuit archipelago. Right off shore, huge limestone cliffs jet out of the water. 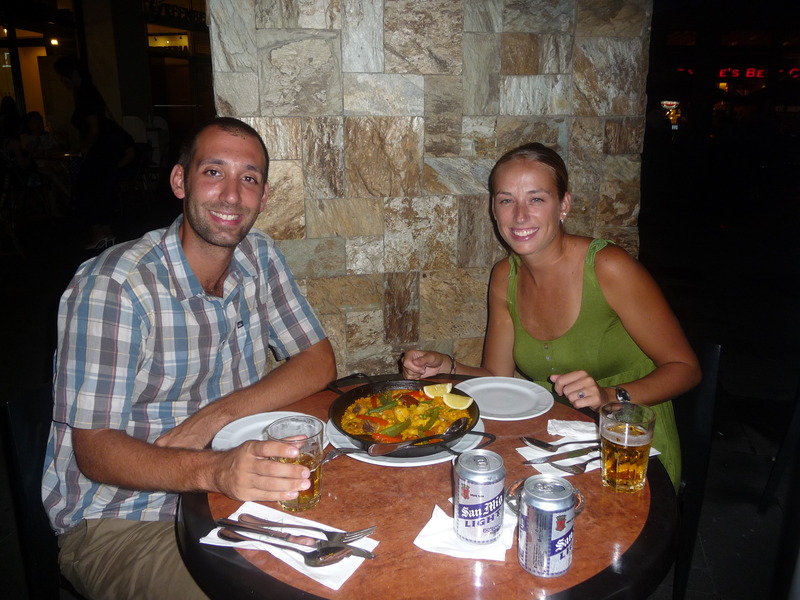 As our trip was soon coming to an end, we spent most of our time in El Nido just relaxing and drinking San Miguel (the local beer). One of the days, we hired a boat to take us out on the water to see some of the spectacular scenery and secluded beaches surrounding the town. 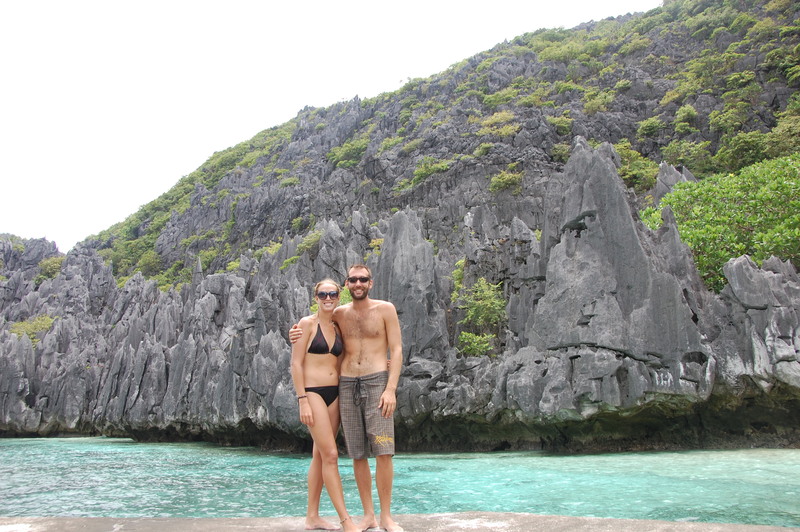 We had made friends with an Australian named Kerry in Port Barton and much of our time in El Nido was spent with him. 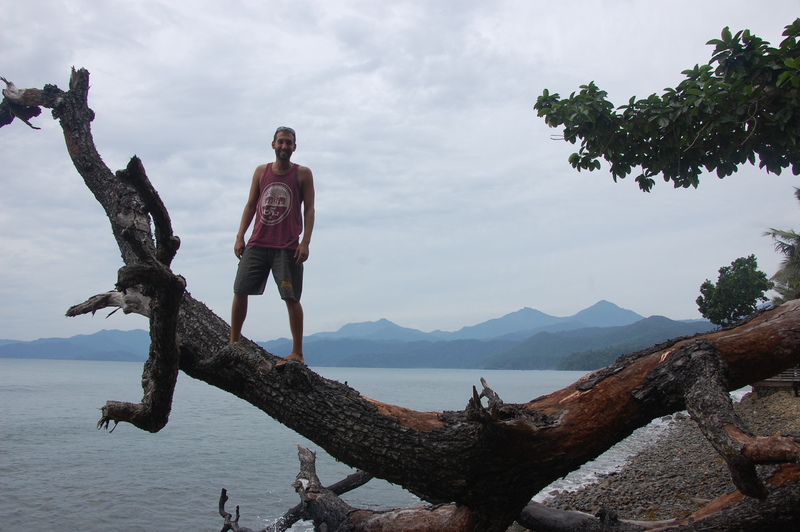 He joined us for our boat ride and together we visited some beautiful coves and picture perfect beaches. All good things must come to end though and eventually it was time to leave Palawan and head back to Manila. We spent our days in Manila scouring the shopping malls and markets for some good, cheap knockoffs and loaded up our bags for the trip home. After 14 months on the road, it was finally time to head stateside. We were heading to Maui to surprise my Mom for my parent’s 30th wedding anniversary and even though we wouldn’t be home for several more months, leaving Manila was emotional. Looking back at all the amazing things we have done, people we have met and things we have seen, it was hard not to be sentimental. We have many great things to look forward to back in the States, but just knowing we were leaving the craziness of backpacking around the would was tough to think about. We hope that you have enjoyed reading about our adventure and we hope that you will continue to read the blog as we have a few more places to report on before starting our life back in Denver! Stay tuned! So there we were…exploring the underwater life at one of the top diving destinations in the world. 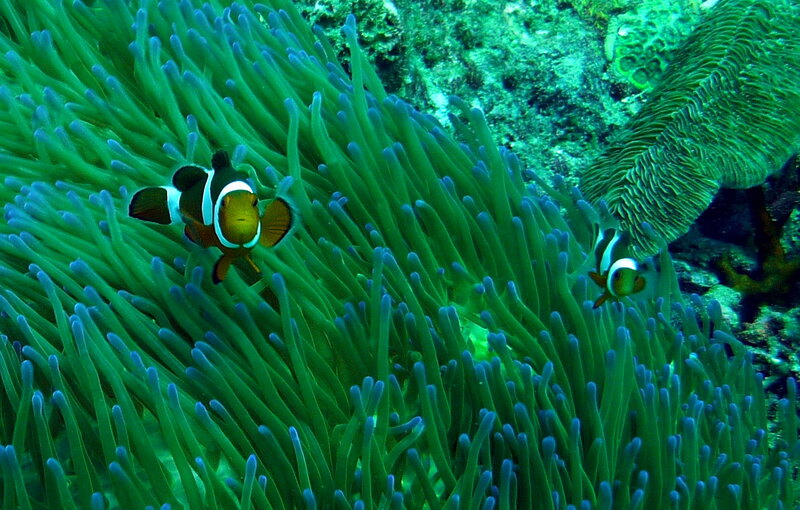 When diving in Indonesia, everyone we met said “you’re going to Borneo? 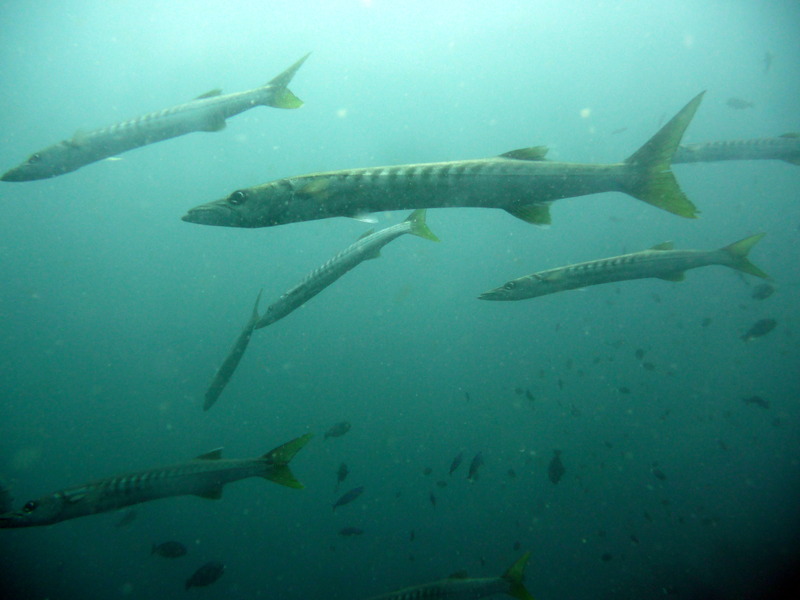 You MUST go diving at Sipadan!” We had never heard of this place before, probably since we were a bit new to diving, but after doing some research online, we made a plan to visit the infamous island of Sipadan to see what it was all about. 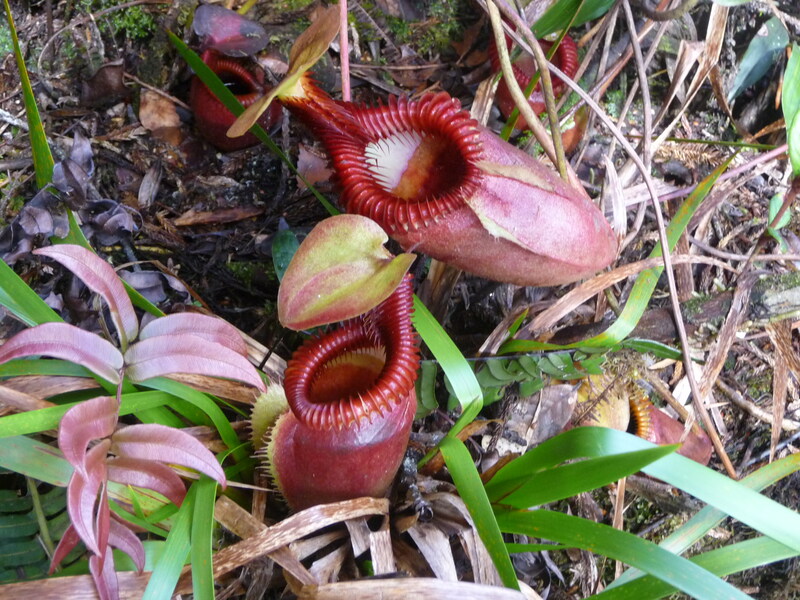 This was, yet again, another thing in Borneo where we had to plan ahead, but this time we did! 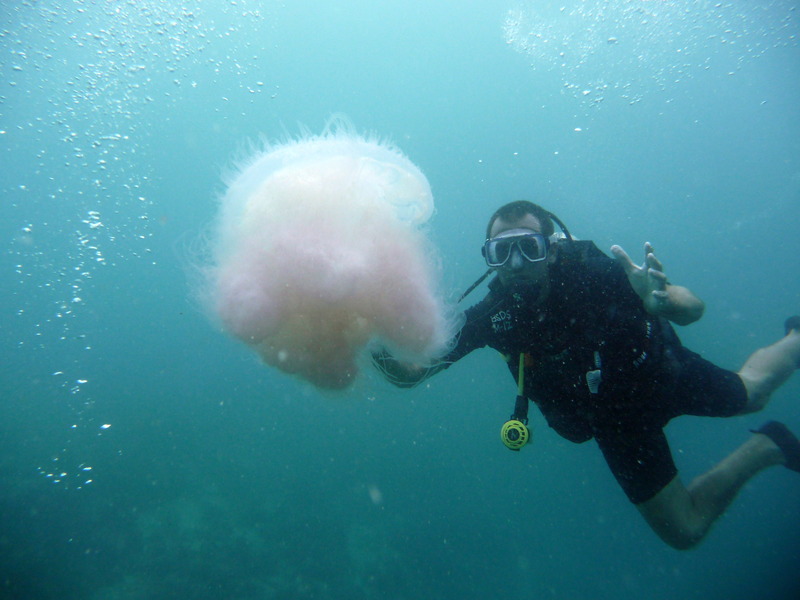 Only 120 permits are given out for diving at Sipadan each day and they can be sold out months in advance. 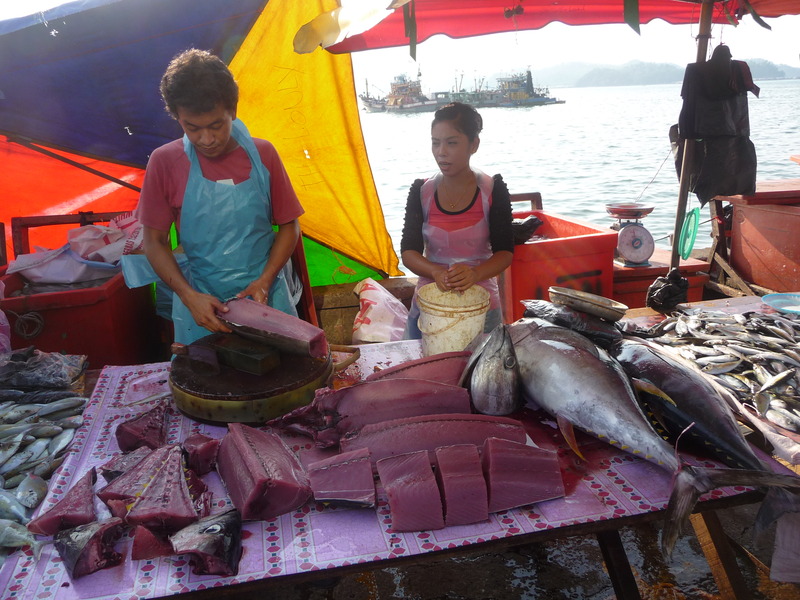 This being our last stop in Borneo, it was easy to work out some dates and email some diving operators. After several “we are sold out” emails, we came across Billabong Scuba who had two permits for us. 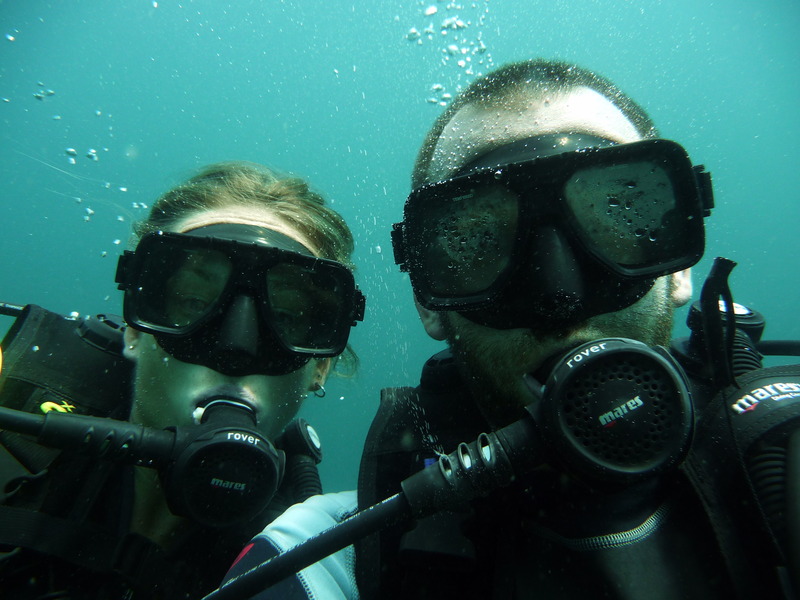 After ending our time at the river, our day of diving at Sipadan was still almost a week away. Once again, we tried to visit another jungle park for animals spotting, but again, since we didn’t plan ahead, the accommodation was full and we were not able to go. So, we decided to head to Semporna (the coastal, gateway town to Sipadan) to see if we could do more fun diving around some of the other surrounding islands. Semporna turned out to be one of the worst towns we have visited and not a place you want to spend more than one night. We quickly tried to find an alternative place to spend a few days and came across Singamata Resort. The entire hotel is built on stilts over the clear blue water so you can leave your room and step right down into the water, it was exactly what we were looking for. 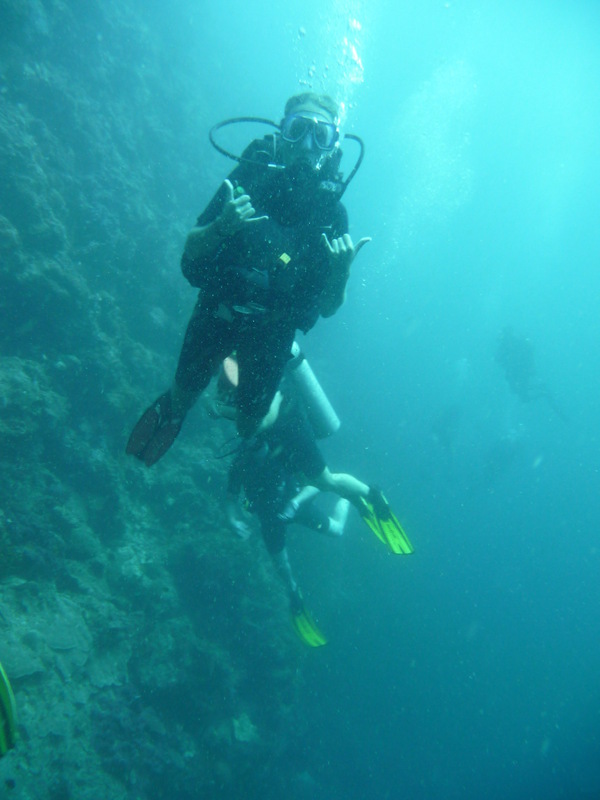 Since they also had a dive shop, Becky decided to do her PADI Advanced Diving Course (Jason didn’t want to do his) and Jason spent his days snorkeling and visiting the surrounding islands on some fun dives. 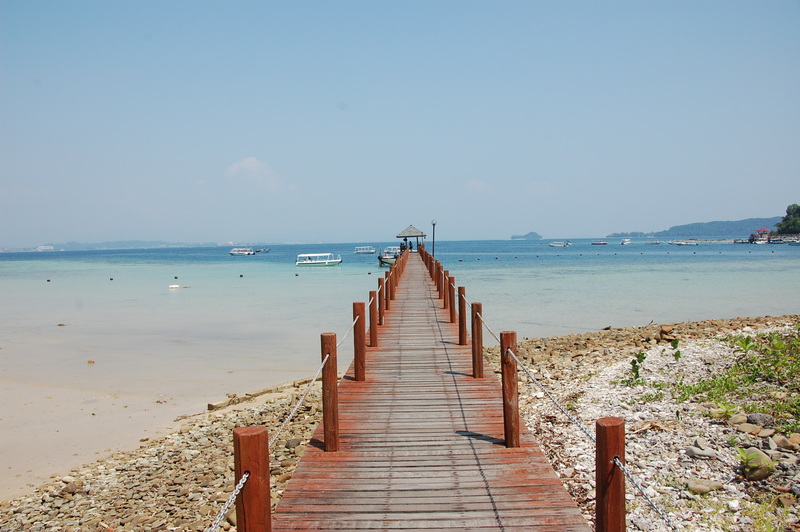 It was a great place to relax and dive for several days before it was time for our reservation at Billabong. Several years ago there used to be accommodation out on the island of Sipadan, but to protect the area and underwater life, they ordered all dive centers to leave. Now, all the dive shops operate out on the island of Mabul, a short boat ride away from dive sites. This is where Billabong’s accommodation was and where we bunkered down for several days. 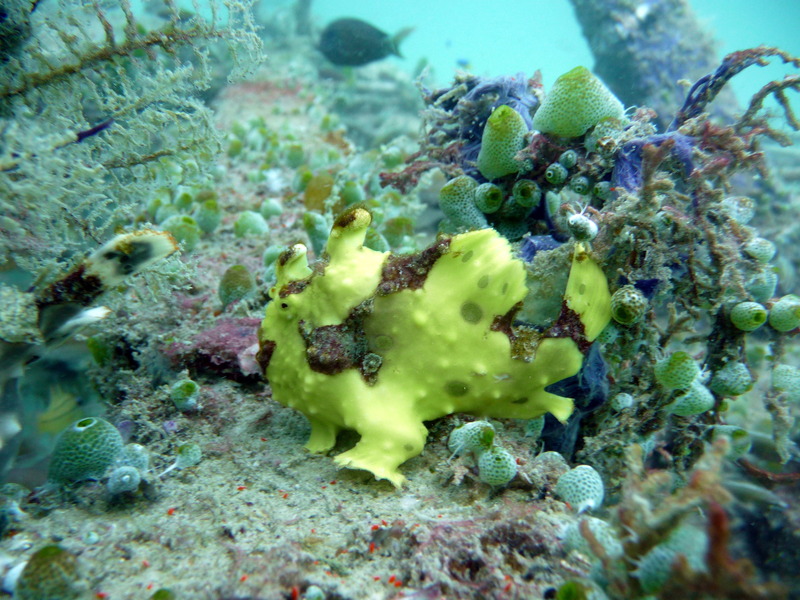 In order to get a Sipadan permit, you first had to dive around Mabul, which turned out to have some great things to see. Doing three dives, we saw a lot of frogfish, many turtles, a large jellyfish, some eels, stingrays and even a spotted eagle ray. 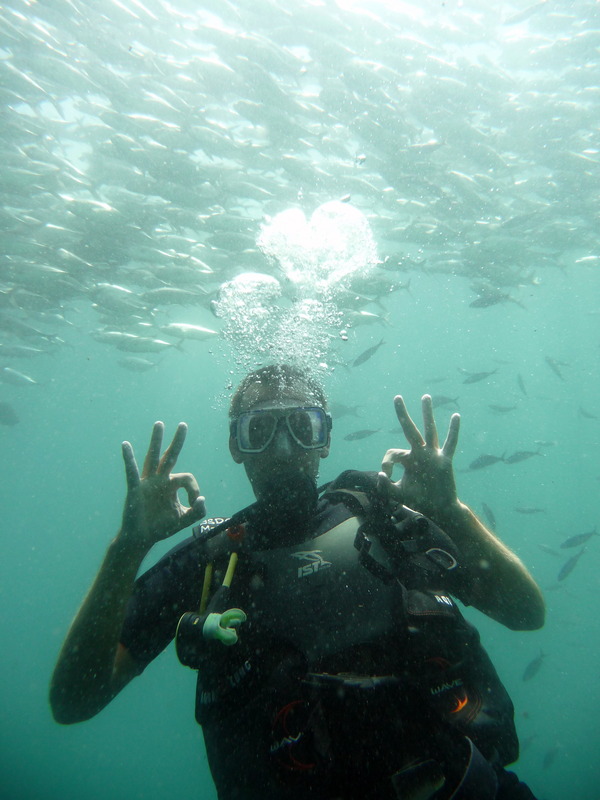 We were very happy with our diving around Mabul but were anxious to see what Sipadan was all about. 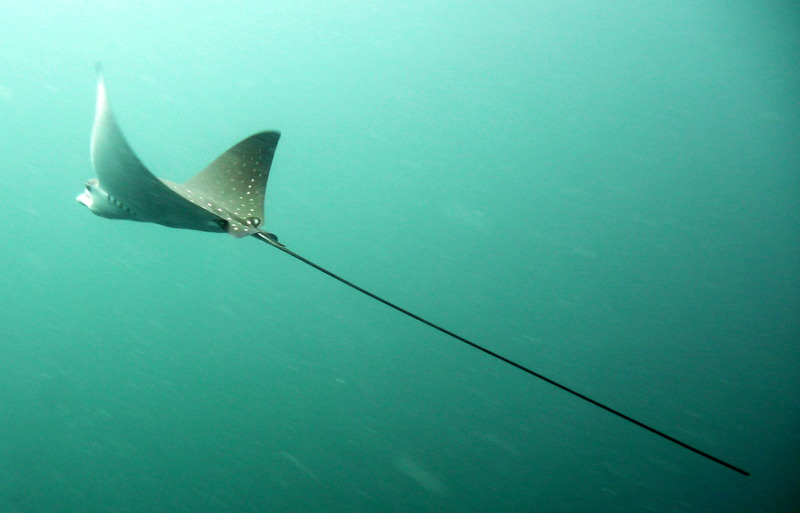 The next morning, it was finally time to head out to the legendary Sipadan. A beautiful white-sand beach greeted us as the boat pulled in and we hoped off to register. After a quick briefing by our dive master, we jumped in and soon spotted our first of many turtles. The entire island is surrounded by a huge, deep wall and each dive site is similar with beautiful, colorful corals and plenty of big fish. The animal to spot here is the hammerhead shark, but to find them you must be very lucky. 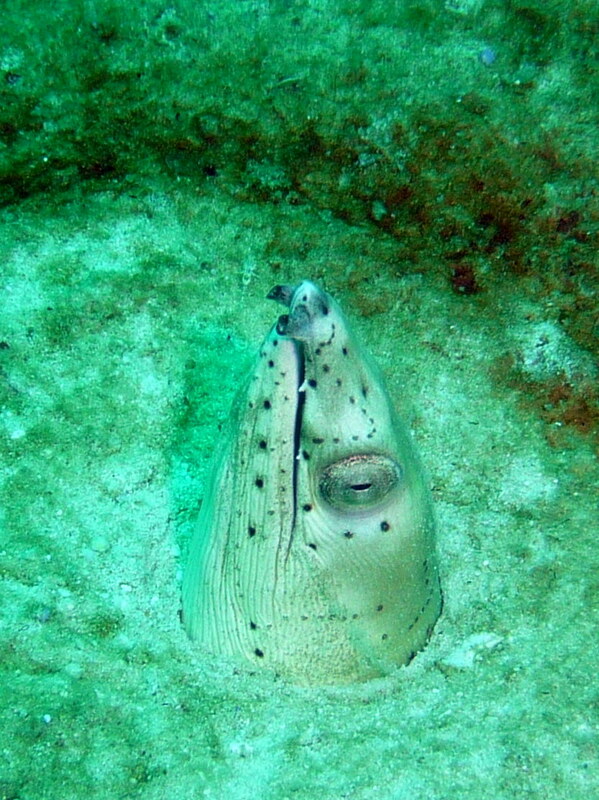 Unfortunately, we didn’t see any hammerheads, but on all three dives, the underwater life was overwhelming. We saw too many turtles to count, sometimes three or four all around us swimming, a few sleeping on the coral wall and we even saw some stuck together in a turtle sandwich mating. 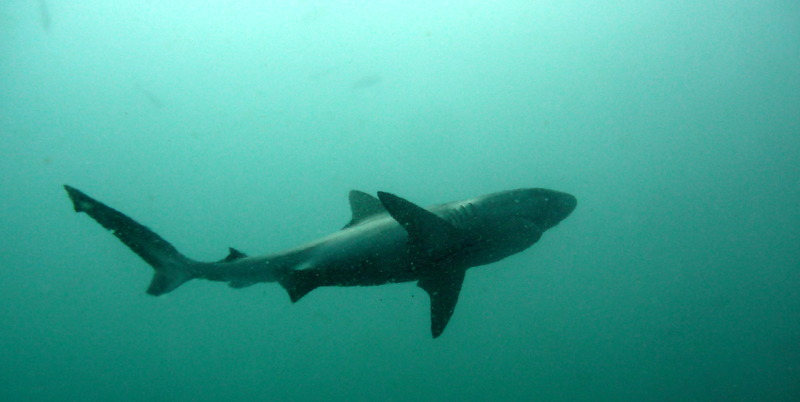 We spotted about 20 sharks, huge schools of jackfish, barracuda, another eagle ray and many other supersized fish. Everywhere we looked there was something impressive swimming around us. So did it live up to the hype? You bet it did! Now we know why so many people told us to go there, it was the one of the best days of diving we have done of this whole trip. 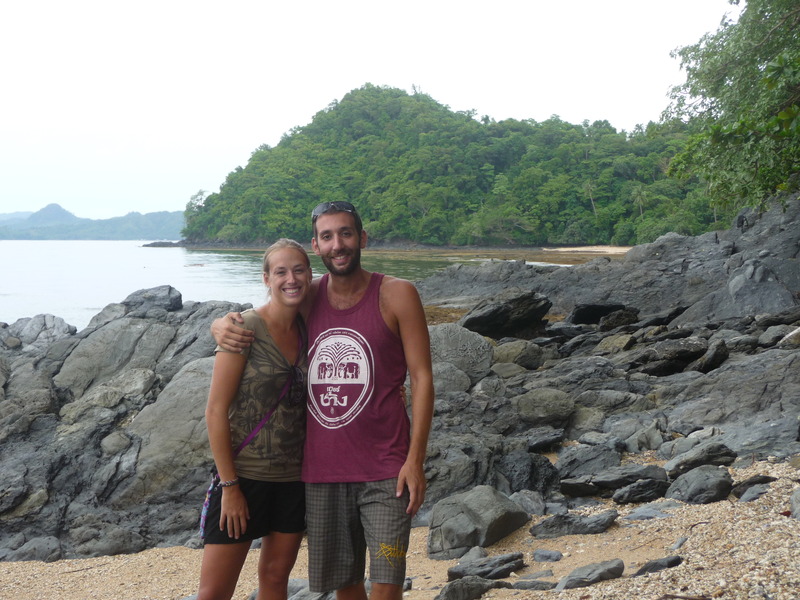 After visiting Singamata and then diving around Mabul and Sipadan, we both needed a break from the water. We spent our last few days in Borneo just relaxing at Billabong before heading back to Kota Kinabalu where we had to catch a flight. 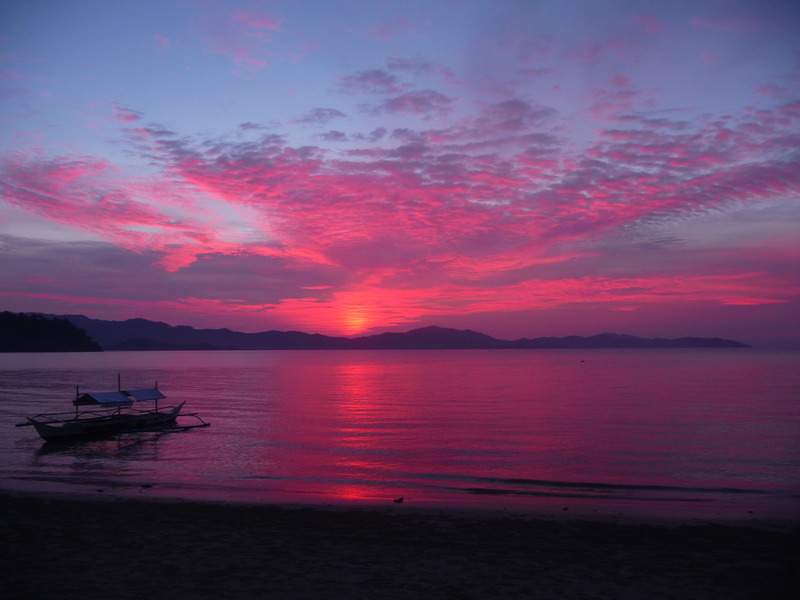 Next stop, The Philippines, where we are looking forward to becoming a beach bum for several weeks! Having too much time in Malaysian Borneo, we booked plane tickets to far in advance so we were kind of ‘stuck’ there with not enough to do. This led to many boring days. So there we were…cruising along the Kinabatangan river, looking for wild orangutans and other unique Borneo animals. After our hike, we were ready for some fun and R&R. 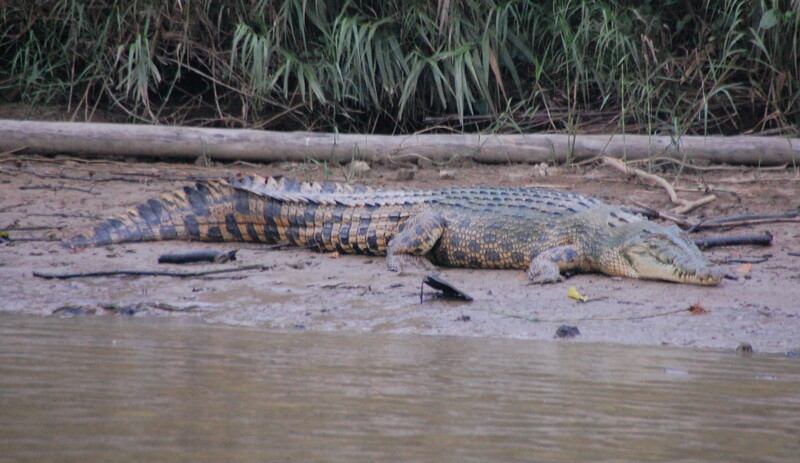 We had heard a lot about the Kinabatangan river and the wildlife spotting you can do there so we called up and booked a package with one of the lodges along the river bank. We got lucky that they had a shuttle passing by our lodge on the way out to the river so they swung in and picked us up along the way. Arriving at Nature Lodge Kinabatangan, it felt a bit like summer camp for adults. We had scheduled activities throughout the day and pre-set meal times where we all gathered around the restaurant to share stories about what we saw that day. We were staying in the dorm, but were lucky and had the room all to ourselves the whole time we stayed there. 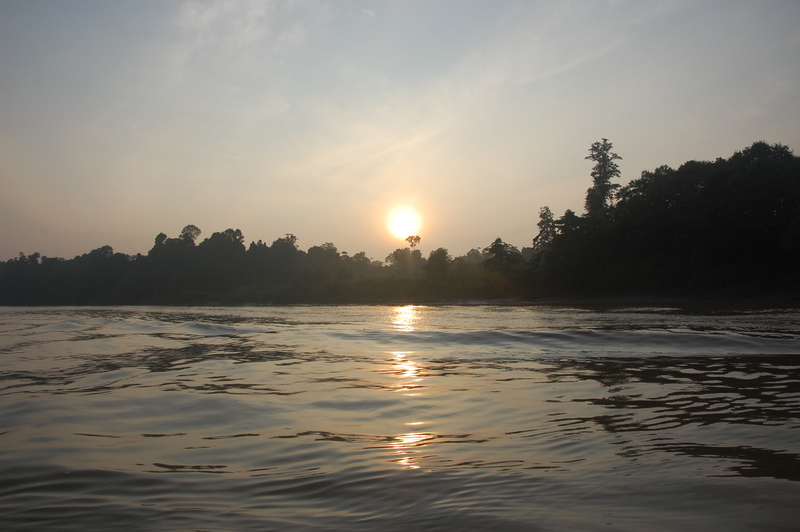 The package included four boat rides on the river, one jungle walk and two night walks. As soon as we put our bags down, it was time for our first boat trip. Setting out at dusk, we cruised up and down the muddy brown river for two hours. 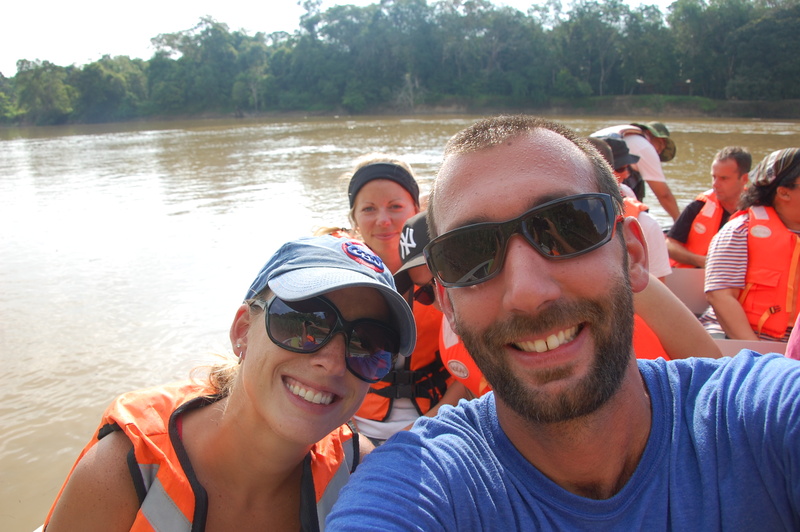 The following day we were up early for the sunrise cruise, then our jungle walk (which was extremely muddy!! ), then again back for the sunset cruise. We did the night walk the first night, but didn’t see anything so we decided not to do our night walk again on the second night. We were surprised at how much wildlife we saw. 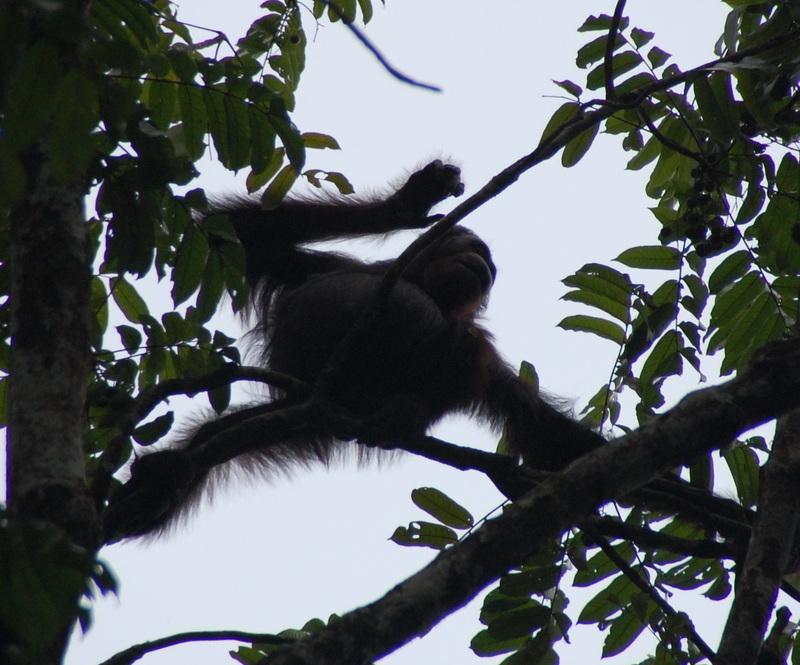 We saw an orangutan (this time completely wild! 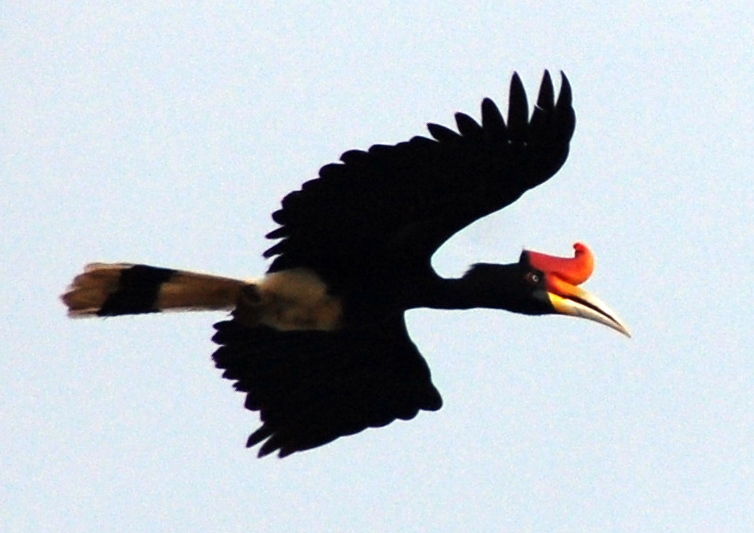 ), huge crocodiles, gibbons, long-tailed macaques (which are everywhere in Asia), pig-tail macaques, beautiful hornbills, kingfishers, proboscis monkeys, large monitor lizards, small snakes and some langur monkeys. It was great to see so many things, but a shame why so many animals are crammed into one area. Many of Borneo’s jungles have been cut down to make way for palm oil plantations (which is used in a lot of things that we eat or cook with at home). 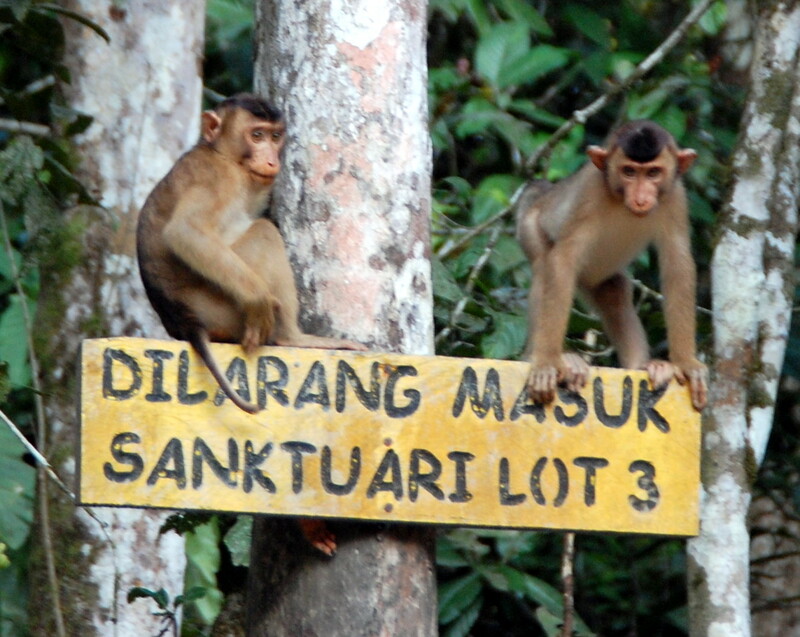 It is a huge business and while driving across any part of the country, the plantations and palm oil trees are endless. 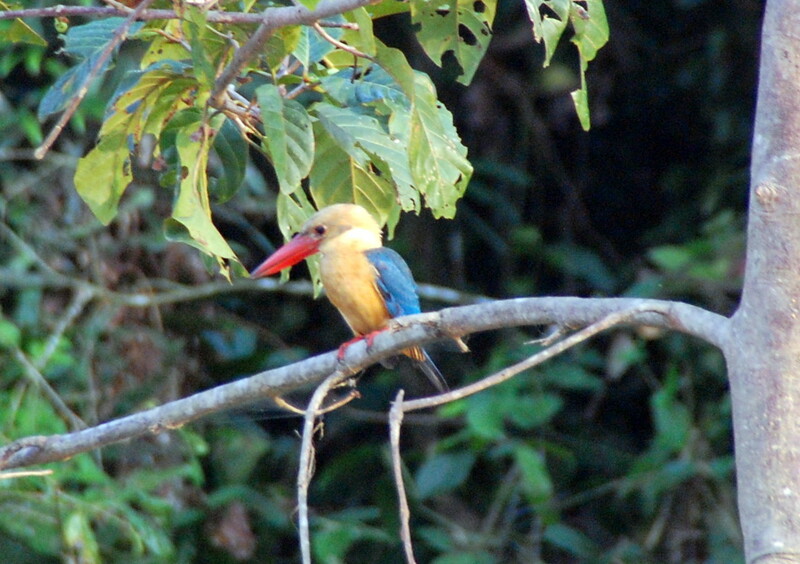 The Kinabatangan river is a small section of jungle that has been preserved for these animals and is turning out to be one of the few places left in Borneo where you can see some of these animals in the wild. After several days of animal spotting along the river, we were anxious to make our way to our next destination where instead of looking for animals above water, we would be spending most of our time underwater. 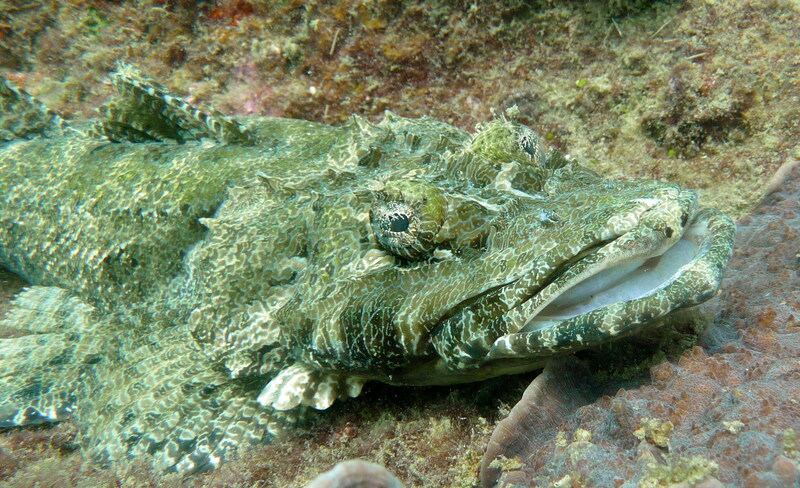 Stayed tuned for our next blog about diving at one of the top destinations in the world! Romping through the mud on our jungle walk, we hadn’t had that much fun playing in mud since we were little! 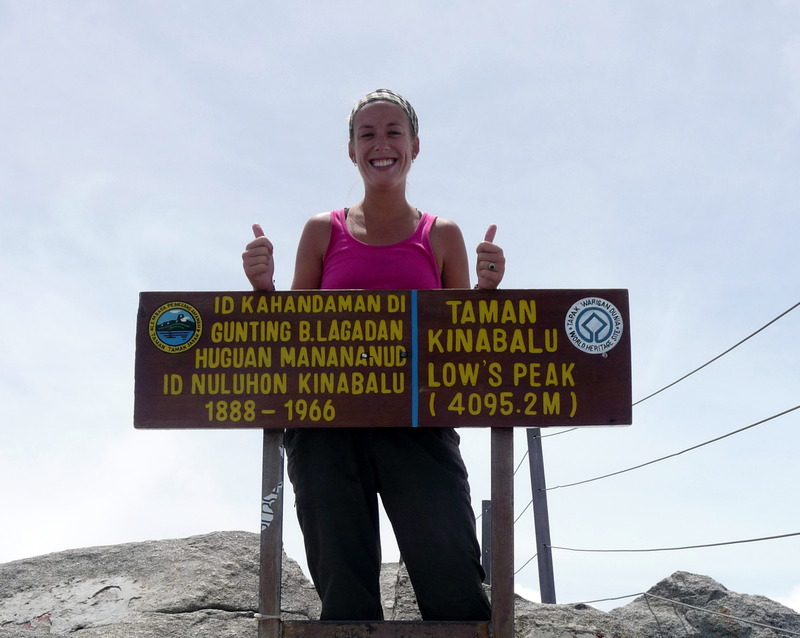 So there we were…climbing up 7,300 feet and then all the way back down again on one of Asia’s largest mountains, Mt. Kinabalu. Mt. 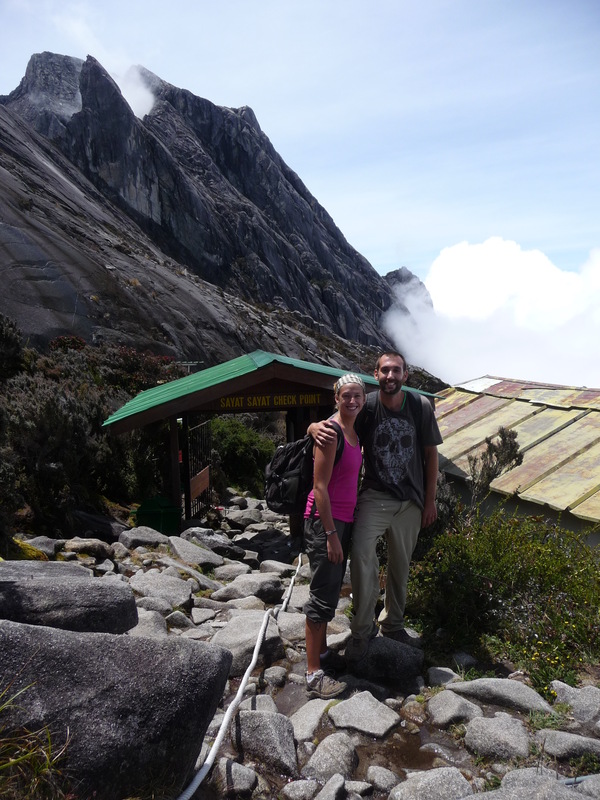 Kinabalu is a popular destination for most people traveling in Borneo. It is the highest mountain between the Himalayas and the Snow Mountains of Papua New Guinea. The peak sits at 4,095 meters (13,500 ft) and the typical trek involves two-day of hiking. 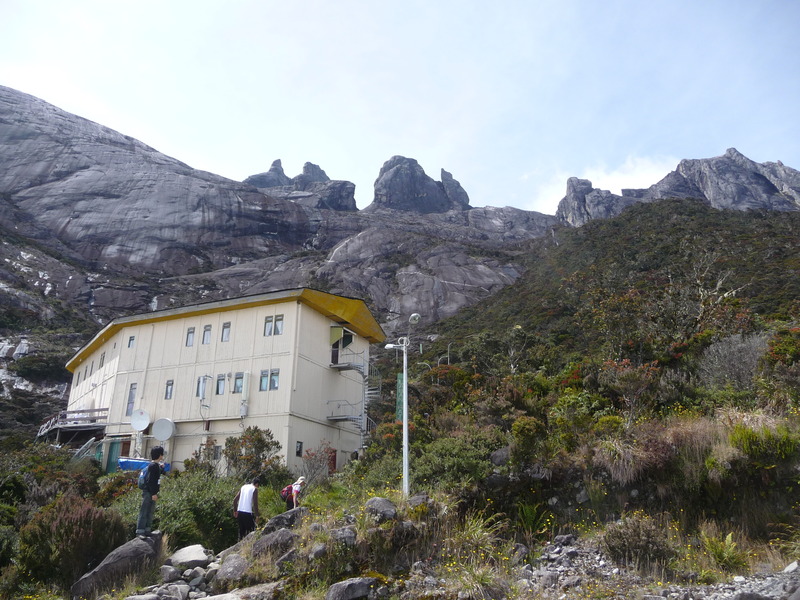 The first includes trekking from the park headquarters to Laban Rata Resthouse just below the summit. The second usually involves waking up at 3:00 am to push to the summit for sunrise. 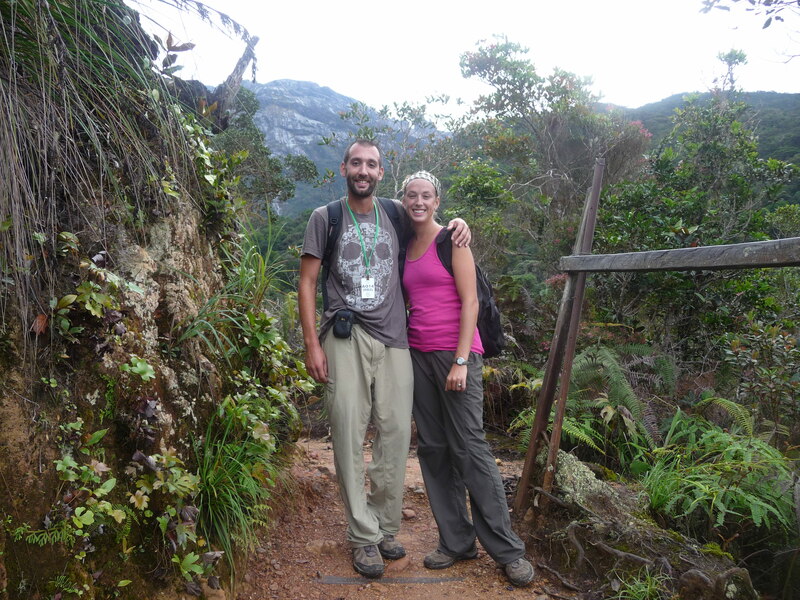 The mountain is so popular for climbing though that you must book your trek up to 6 months in advance. Well we all know how good we are at planning ahead! We didn’t have anything booked when we arrived as we thought we could just show up and try to get permission from the park ranger to climb the whole mountain in one day. We knew the hike would be much more difficult in one day, but we were up for the challenge and got dropped off at the headquarters to see what we could figure out. We had heard that it was tough to try to convince the staff to allow you to do it in one day, but when we arrived, the girl at the counter really didn’t try to discourage us and she set up a meeting with the head park ranger. We were given a quick “interview” by the ranger and told some guidelines; be at the headquarters by 7:00 am (we were not able to start any earlier), be at Laban Rata Resthouse by 11:00 am (which takes most people 4 – 6 hours on their first hiking day), be at the summit by 1 pm (which normally takes people 3 – 4 hours done in the middle of the night) and be all the way back down by 5 pm. No exceptions and no arguing with our guide if we had to turn around close to the top because we didn’t meet our time limits or the weather turned bad. We both told him these rules were acceptable and he shook our hand, wished us luck and sent us on our way. The one day option was nice because we didn’t need to book in advance and by not staying at the Laban Ratu Guesthouse, we saved about $150 each (yes, it cost that much to sleep in a dorm bed for only a few hours before beginning the hike at 3 am). Heading to a nearby mountain lodge, we went to bed early to make sure we were good and rested for the next morning. Getting to the park at 6:45 am, we waiting patiently for the office to open. There we paid our fees, met our guide and off we went. We took the shuttle the first 4 km to the main start of the trek and, already keeping an eye on our watch, we didn’t actually hit the trail until 7:30 am. Trying to pace ourselves for the hike to come, we started out on the gradual sets of stairs in the beginning. Soon those stairs multiplied and we realized the trail was unforgiving with no flat surfaces or areas to give your legs a break. Up and up and up we went. Making good time though, we reached Laban Ratu in 3 hours at 10:30 am ahead of schedule. Our guide went to get permission from the ranger to continue our push to the summit while we rested our tired legs and ate some food before continuing on. We came back with the good news that we had hit our time limit and the weather was still clear so it was okay for us to proceed. Starting out on our push for the summit, we climbed up more stairs and eventually came to some big rocks that we had to scramble using our hands or the rope chain provided for support. As soon as we started our ascent though, Jason began to feel a bit ill and was slowly falling behind. He had to take several breaks and eventually lost his lunch after climbing for about an hour. 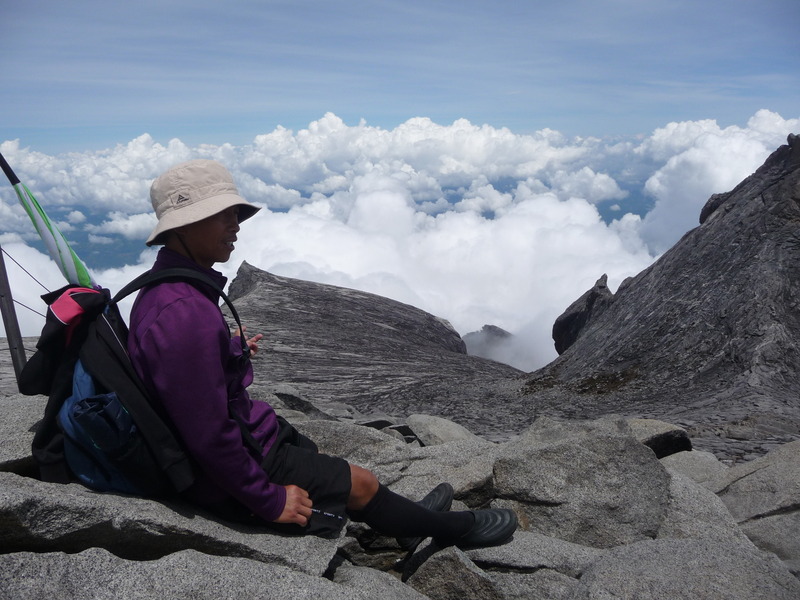 Confined by our time limit, he urged me to go ahead with the guide and continue to try to reach the summit before 1 pm. Hoping he would start to feel better and be close behind, I headed further up with our guide while he laid down to rest. I continued to glance down hoping to see him coming up behind me, but unfortunately that didn’t happen. With extremely weary legs, the final push to the top was a tough one. 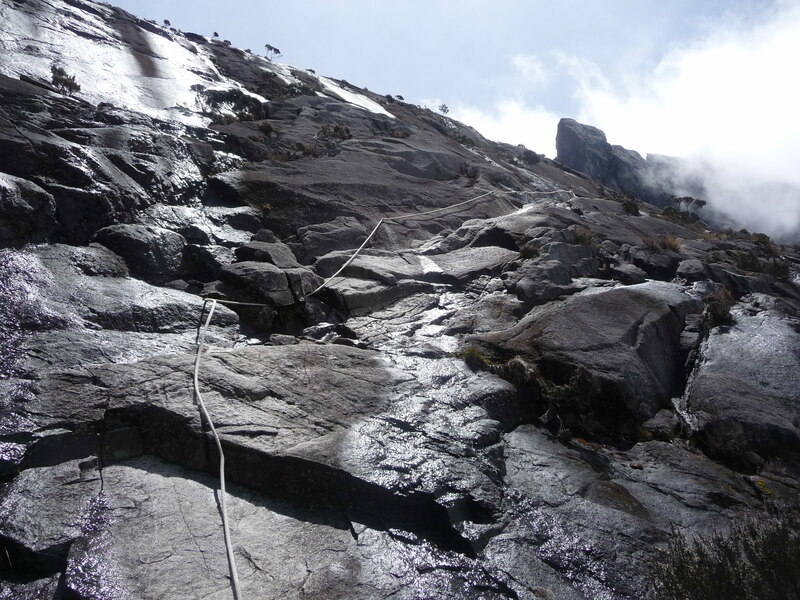 Steep sloping granite slabs stretched endlessly in front with no end in sight. Soon though, as I came up over one slope, the guide pointed to the summit and gave me some encouraging words. Reaching the top at 12:59 pm (one minute before our time limit), we waited to see if Jason would climb over the ridge. After only a few minutes, the guide instructed me that we had to go down as we would not make it back down to the bottom by 5 pm if not. It was an extremely satisfying feeling being at the summit, but it was not quite the same without Jason there with me. Hiking is something he loves to do and I know the accomplishment of reaching the top was important to him. Coming down we found him a half mile from the summit and still feeling ill, but with the time limit it was too late. I know that if we had not been on a time constraint, he would have been able to rest longer and then complete the hike, but we were forced to turn around. Hiking the mountain in one-day allowed us to start before the crowds and be on the trail by ourselves (except for some people coming down). 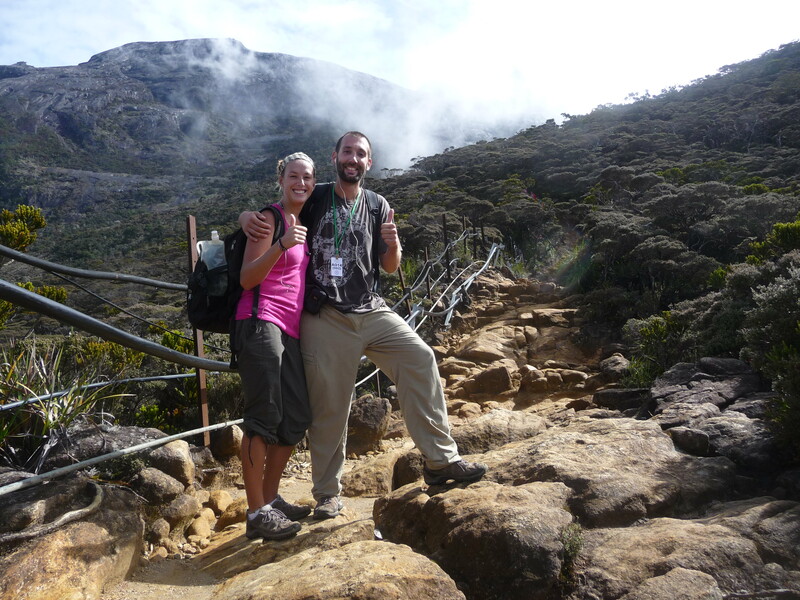 This also meant we were at the summit alone and we could enjoy the view uninterrupted above the clouds. The accomplishment of climbing such a difficult mountain all in one day, the steepness of the trail made the trek very difficult and exhausting. 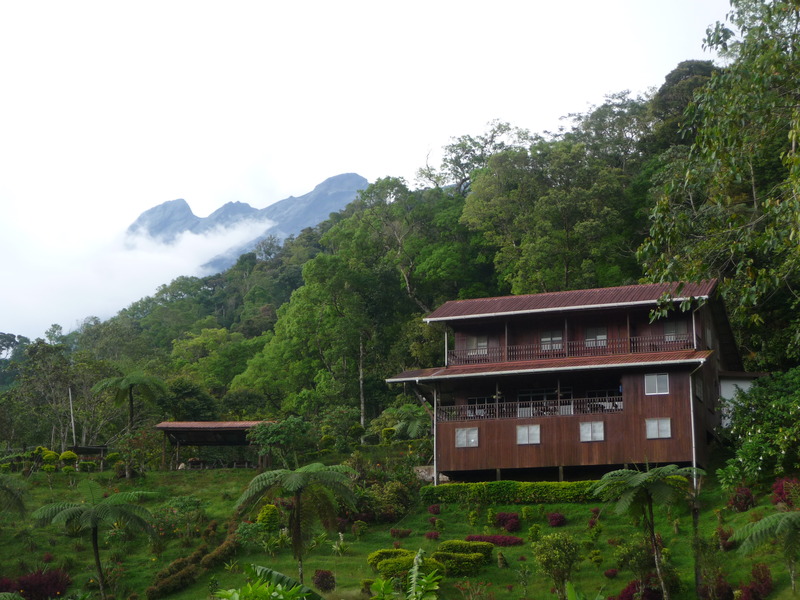 Staying at Mountain Lodge Kinabalu, we met some wonderful people and it was a very pleasant place to hang out for several days. Heading up and up and up! So happy to be at the summit! So there we were…staring at billboards all over town with the face of the Sultan of Brunei, one of the world’s richest men. It felt strange arriving at the airport in Kuching instead of going to the bus station, but in Borneo flights end up costing about the same as bus transport. We took a plane further north to the town of Miri, located just south of the country of Brunei. 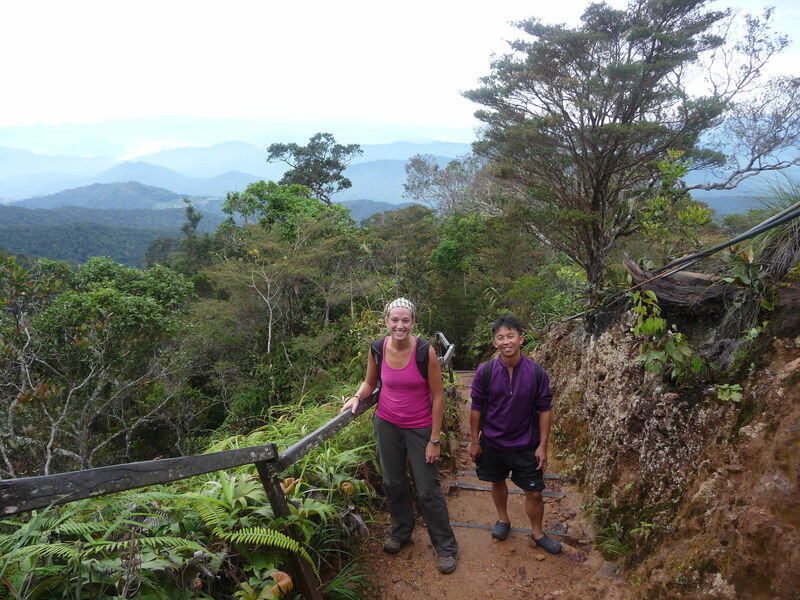 From Miri, we had hoped to be able to visit Mulu National Park and do some hiking, but due to us not pre-planning the trip, accommodation at the park was full and we were not able to go. Instead we decided to just head further up through Brunei and continue on to the northern section of Borneo. 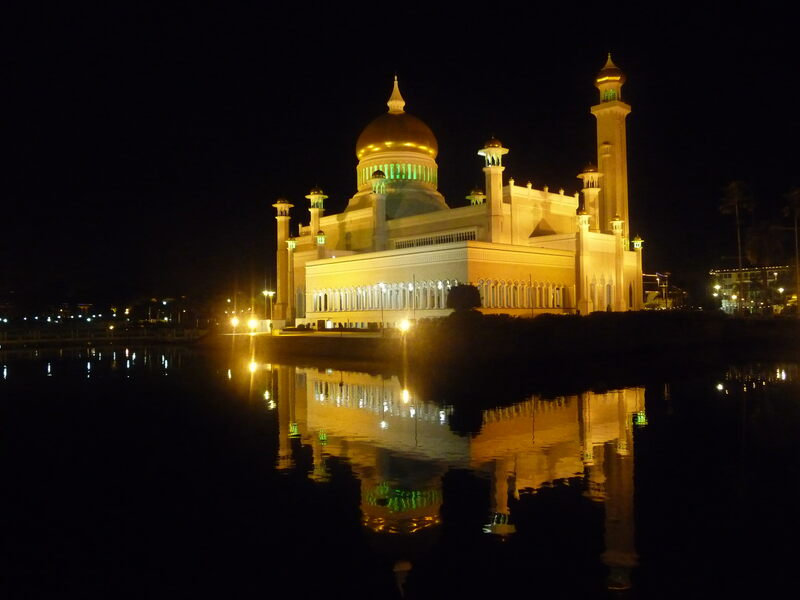 Brunei is a small country squeezed into the western coast of Borneo. Rich with money from the oil in the country, the Sultan of Brunei was named the richest man in the world in 1997 with a net worth of $38 Billion. It is a very muslim society with a very conservation population. The capital city of Bandar Seri Begawan is the only place we visited and we spent a day walking through its clean, but scorching hot, streets. To get a break from the sun, we visited one of the Sultan’s (air-conditioned) museums where he houses a collection of personal gifts from leaders of other countries from around the world. After that, down on the river front, we hired a boat to take us through some of the floating villages surrounding the city. 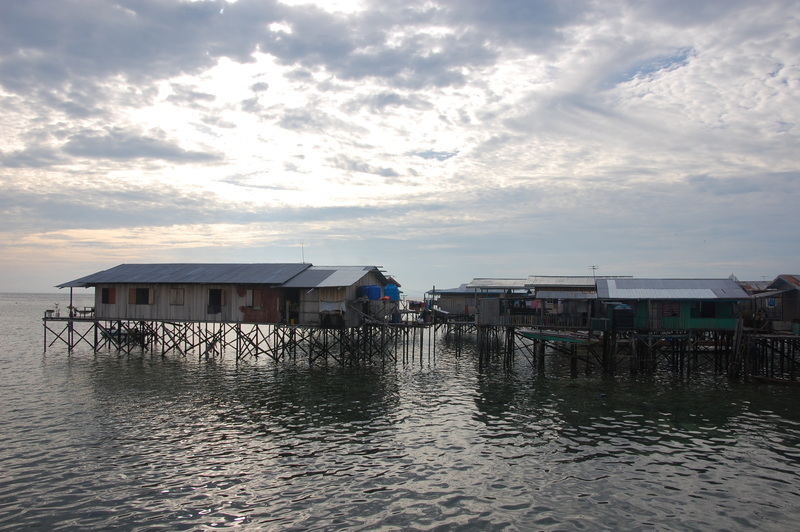 Expecting Brunei to have a high standard of living for most of its residents, we were surprised to see so many shacks built along the water front on stilts over the water. These families have created their own community with floating schools and even a fire station armed with fire boats instead of trucks. It is easy to notice how even though the country is rich with wealth, that money is not always filtering back down to its people. With not much else to do in the city, we only spent one day in Brunei and then continued north back into Malaysia. The best way to leave Brunei is by boat to Pulau Labuan. They call Labuan the Vegas of Borneo, armed with casinos and duty free shopping, but we didn’t see any casinos the whole time we were there. We did take advantage of the duty free shopping though. Liquor and beer were extremely cheap on the island so we didn’t mind spending a few days enjoying ourselves with some drinks at night around the food markets. We also both picked up a bottle of liquor, Jack Daniel’s for Jason and Absolute Mango for Becky, both cheaper than we could buy them in the US! 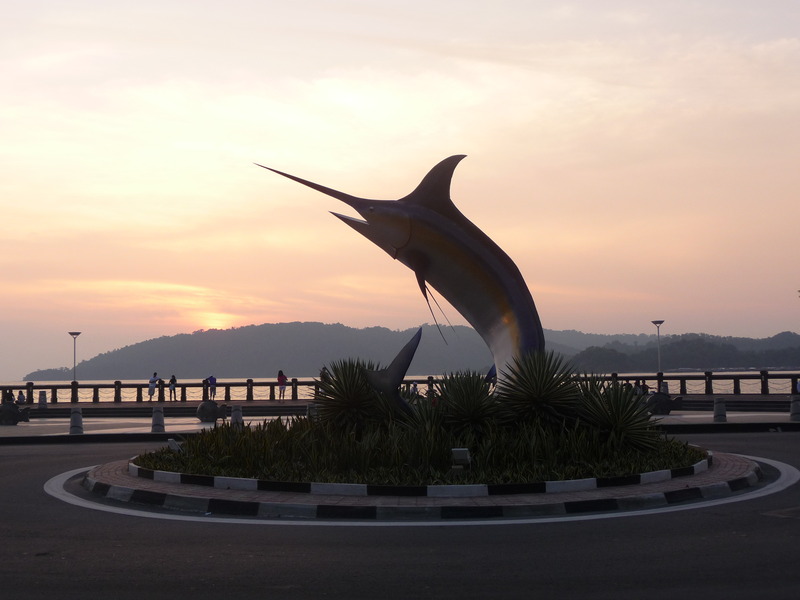 Finally, after several days, we made our way to Kota Kinabalu, Borneo’s “capital” city. Now in the northern, or Sabah, section, we tried to make a plan for the remaining weeks left in the country. First on our agenda was a trip to climb Mt. 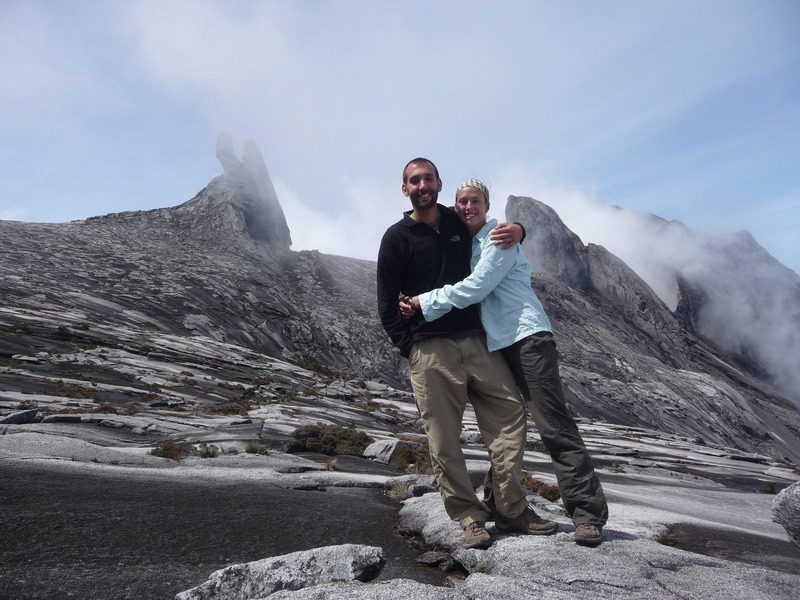 Kinabalu, Asia’s largest mountain. But before heading to the mountain, we decided to take a day trip to Tunku Abdul Rahman Park (TARP), a small island off the coast of KK to do some more diving. 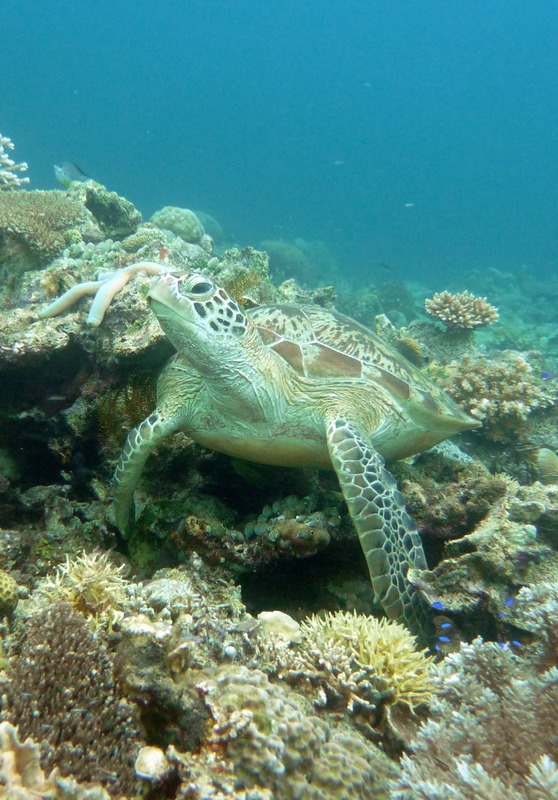 We had been quite spoiled diving in Indonesia where all the sites we visited had beautiful coral and big fish. The diving at TARP was not quite the same with a lot of dead coral and hardly any big fish at all, but the islands above water were picture perfect, which was a wonderful way to spend some time during our breaks between dives. Coming back to KK, we made plans to head to the mountain and took off the following day to see what we could arrange. Even though we were only there a day, checking out the small country of Brunei. A gallon of gasoline goes for $0.40 – $0.50 per gallon there! In front of a floating Shell gas station in Brunei on our water tour - gas there was $0.40 per gallon! 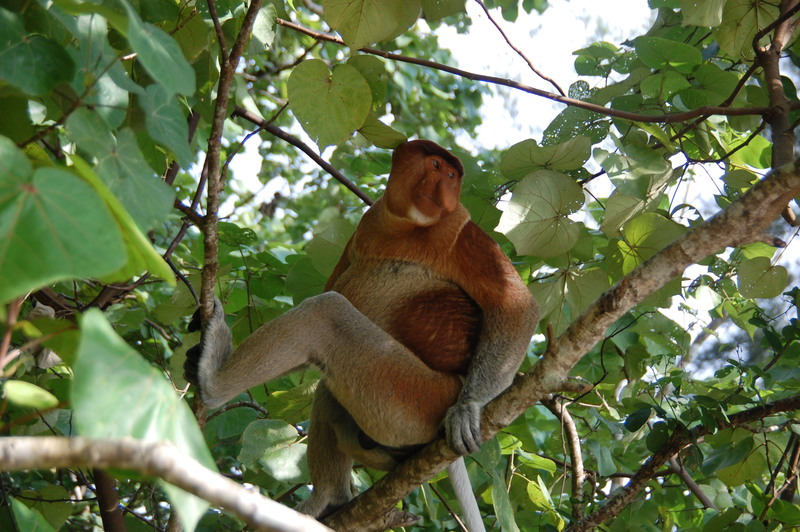 So there we were…watching our ginger cousins, orangutans, swing through the jungle trees as they looked down on us with their cute doughy eyes. 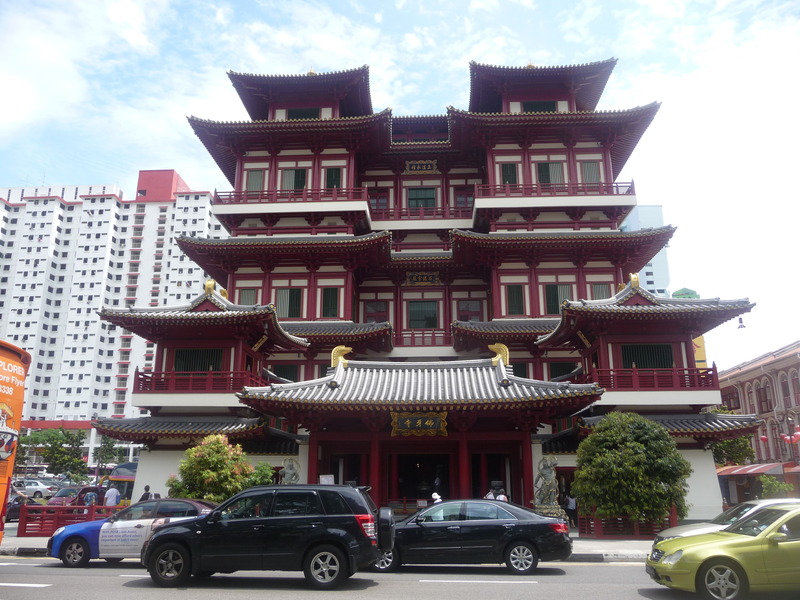 After living it up in Singapore, we had to get back to real life and our normal backpacker ways. 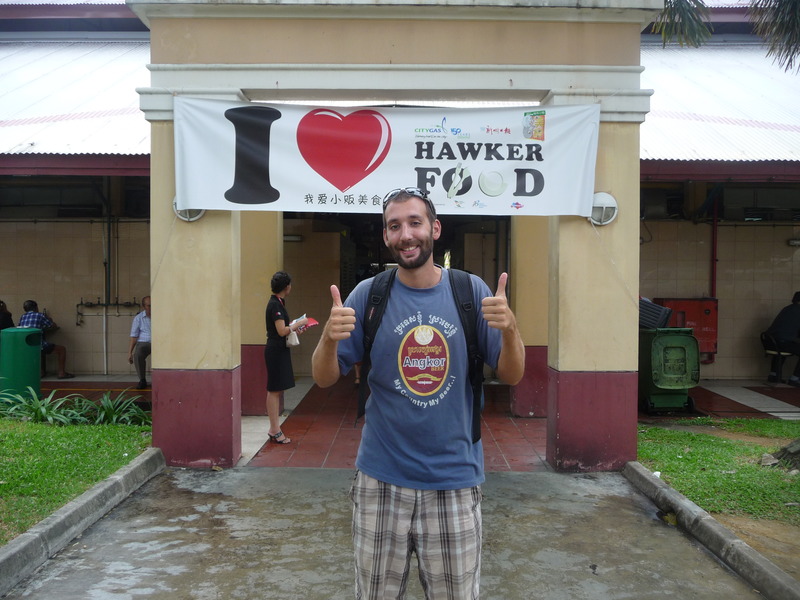 We took a flight to Kuching in Malaysian Borneo, focusing our first week in the southern state of Sarawak. 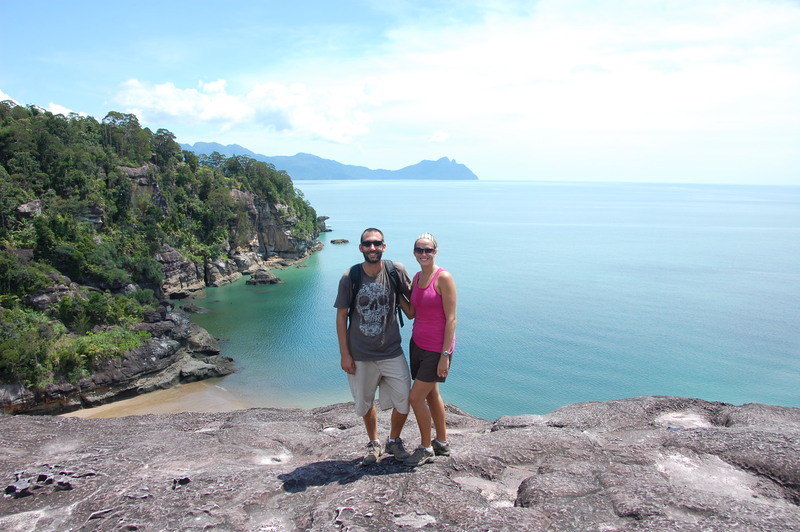 We had spent some time in Peninsular Malaysia six months ago and the area of Borneo turned out to be quite similar. 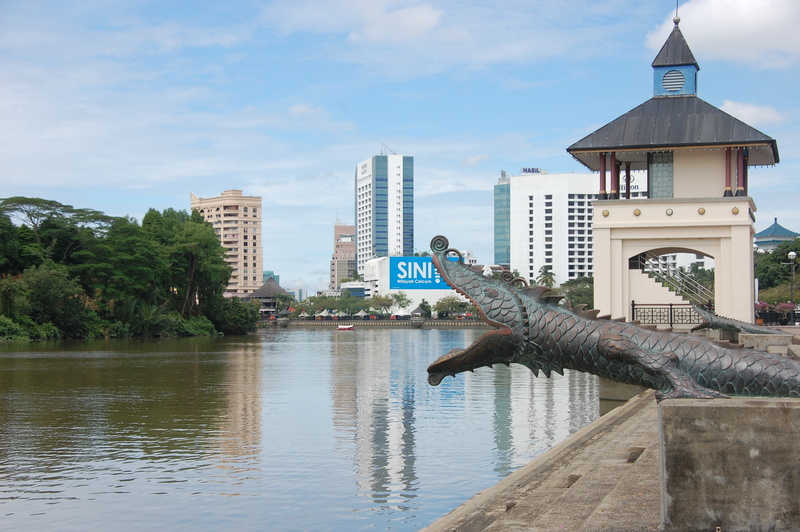 Kuching was a pleasant city to start our time in Borneo; quiet streets, a nice waterfront to wander and even a cheap movie theater where we could escape the midday heat. From Kuching there are a lot of different places to visit so we based ourselves there for several days and set out on exploring the region. Our first day we took a trip to Semenggoh Wildlife Rehabilitation Centre to view our red-headed relatives, the orangutan. 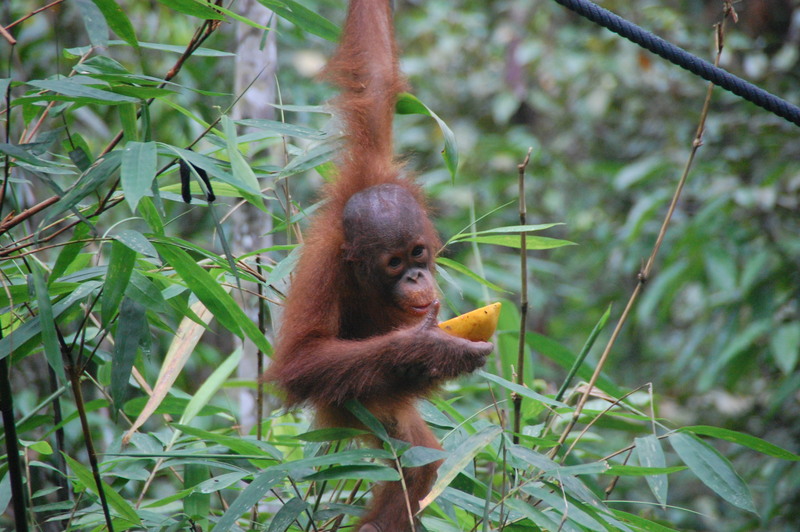 The center takes in orphaned or injured orangutans who can no longer survive on their own. 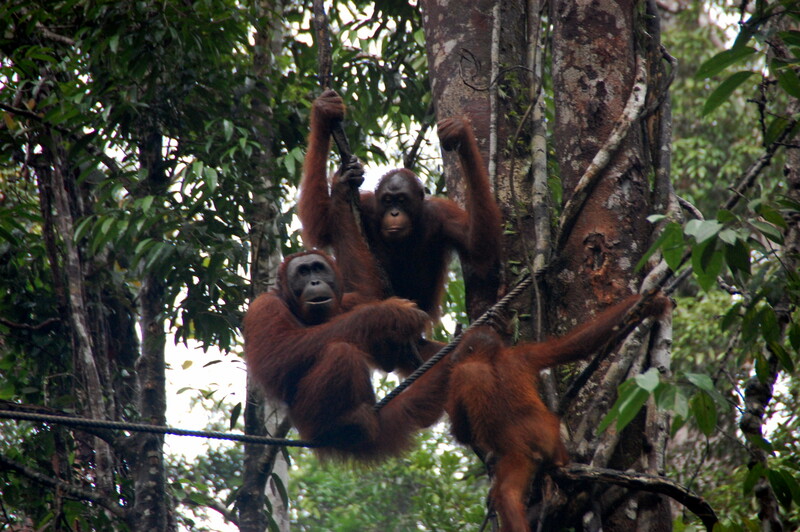 They take the time to rehabilitate and then release them into the jungle around the center. 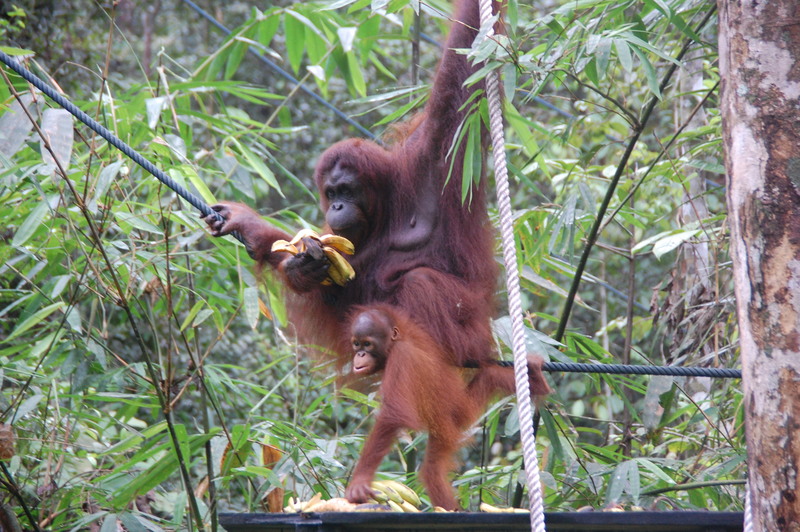 The jungle is quite large and big enough for them to live a semi-wild life, making nests, having babies and finding their own food, but the center puts out fruit twice a day near the headquarters just in case some of the orangutans can’t find a sufficient food supply on their own. We arrived at the center for the morning feeding and weren’t sure we would even see any orangutans as some days none of them come out of the jungle for food (which is a good thing because they are surviving on their own). But, there had been a big rain storm the night before and the employees thought that quite a few might show up. And they were right. 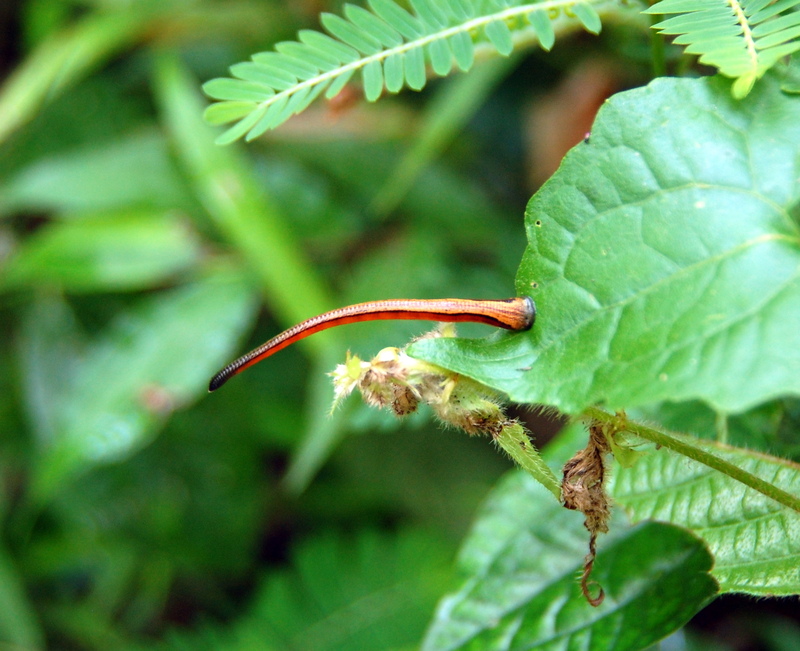 Right before the food was put out, the first one swung through the jungle and hung over the nature center. Soon, more and more kept coming until there were probably 20 of them swinging from the trees and munching on fresh fruit. 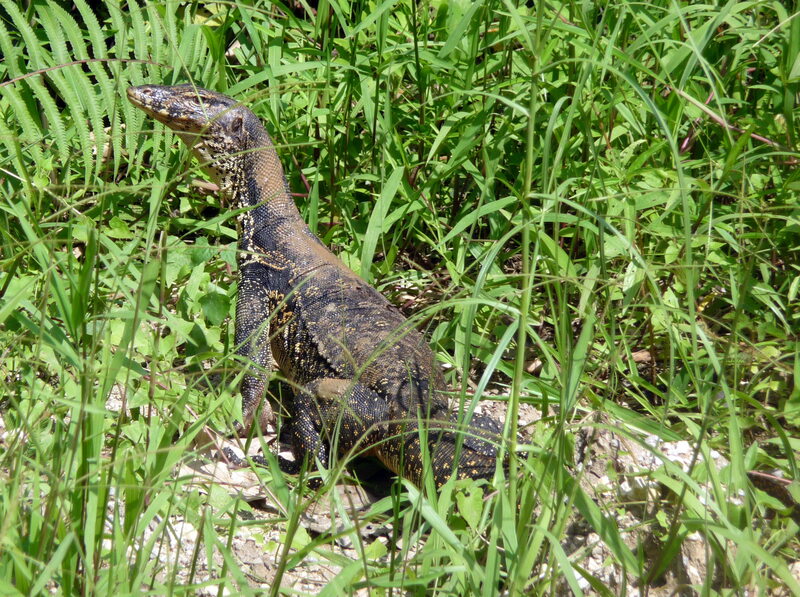 Even though they were not completely wild, seeing them in a natural environment was amazing. They are spectacular animals to watch with many human characteristics and mannerisms. Soon after arriving in Borneo, we realized that many things need to be arranged in advance here (something we are not used to!). Many of the national parks fill up and accommodation can be hard to find. 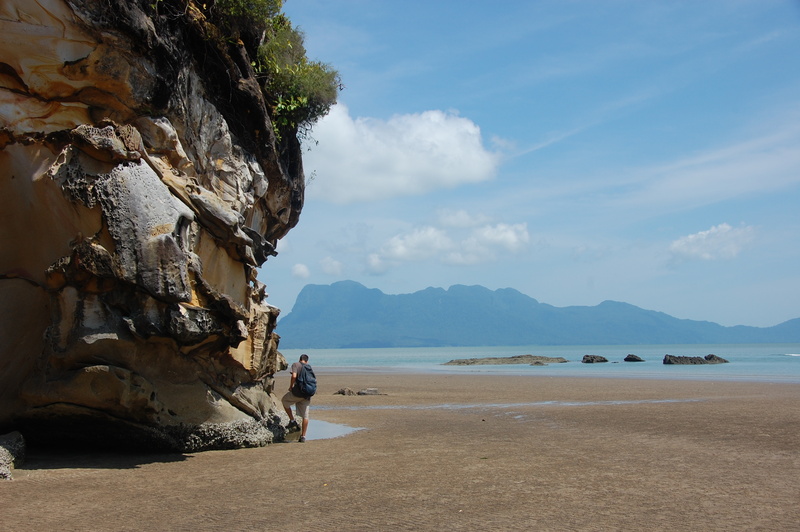 Bako National Park was on our list as a must see destination in the south and we got lucky getting a one night reservation out at the park. Our reservation wasn’t for a few days though so we ventured to Kubah National Park, another nearby jungle, for a day trip of hiking. 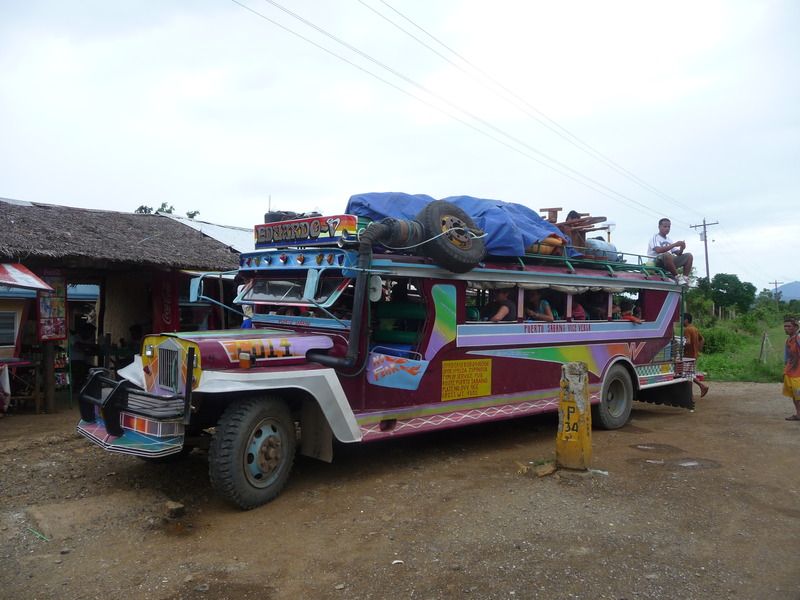 We rented a motorbike and made our way out of the city and eventually to the park headquarters. We chose a trail that cut through the park to Matang Wildlife Centre where we could see some more animals that were being rescued and rehabilitated. 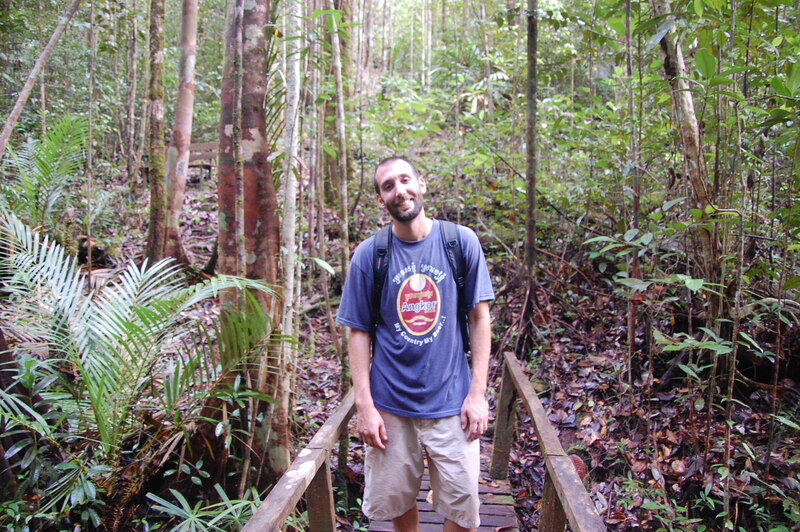 The walk was nice through some thick jungle, but the humidity was almost unbearable and we left completely wet and sweaty, something we have had to get used to throughout SE Asia. Finally ready to head out to Bako, we jumped on the public bus to the park office and then onto a park boat to take us around to the entrance. Since the park is only accessable by boat and it has no roads, it felt a world away from the Kuching even though it was only an hour away. The area is filled with walking trails and lots of animals to see so we dropped our bags and ventured out to see what we could spot. We chose a trail taking us to a large white-sand beach where we could swim. The trail was not as jungly as we had hoped and a lot of the time we were exposed to the sun, but this made our dip in the ocean all that more deserving. We didn’t see any wildlife on our walk, but around the beach in front of the rooms and restaurant, there was plenty to see. 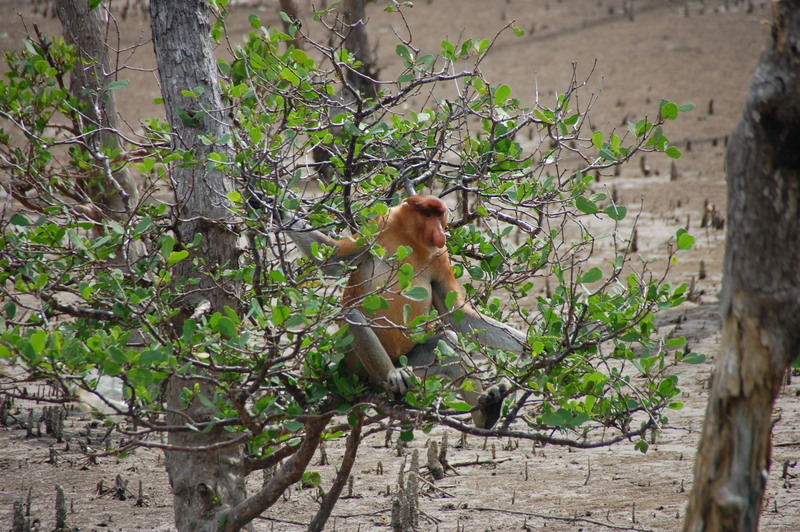 One of the first animals (and one of our favorites) we spotted at Bako was the proboscis monkey. 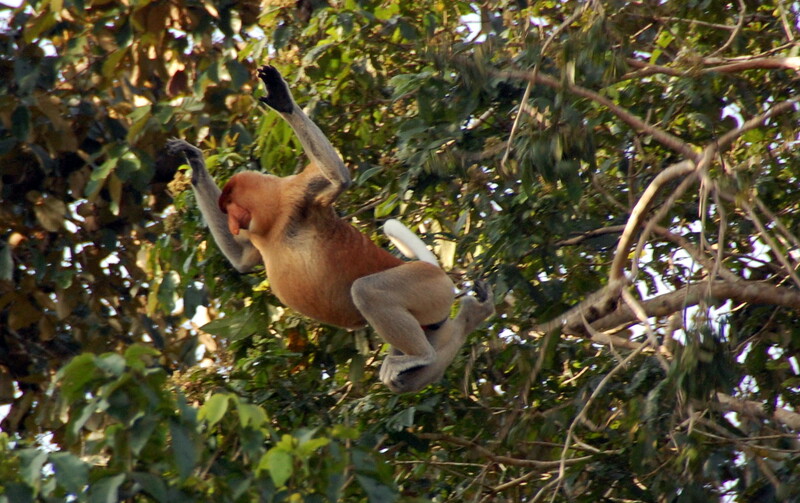 With their distinctive long nose and pot-belly, they sit high up in the trees munching away on leaves and fruit. 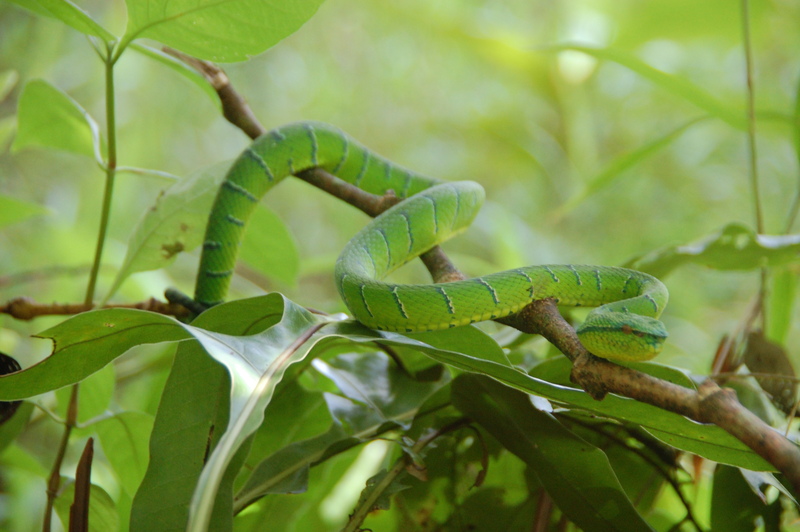 We also spotted bearded pigs, lots of frogs and a couple of very poisonous pit vipers. As always, after a few adventures around Kuching, it was time to move on again. This time though we jumped on a plane instead of a bus, it was the first time we have ever flown within a country after arriving, it was a very welcome change! Don't they look so human with their long nose and fat belly? 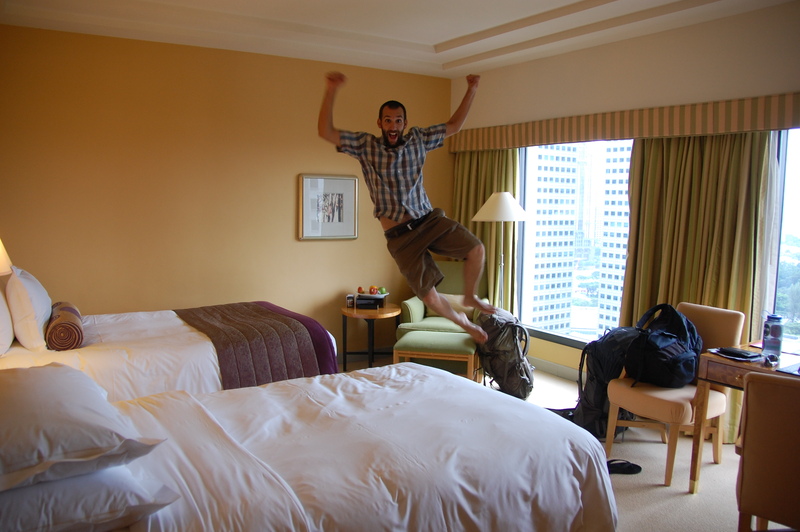 Celebrating One Year on the Road in Singapore! 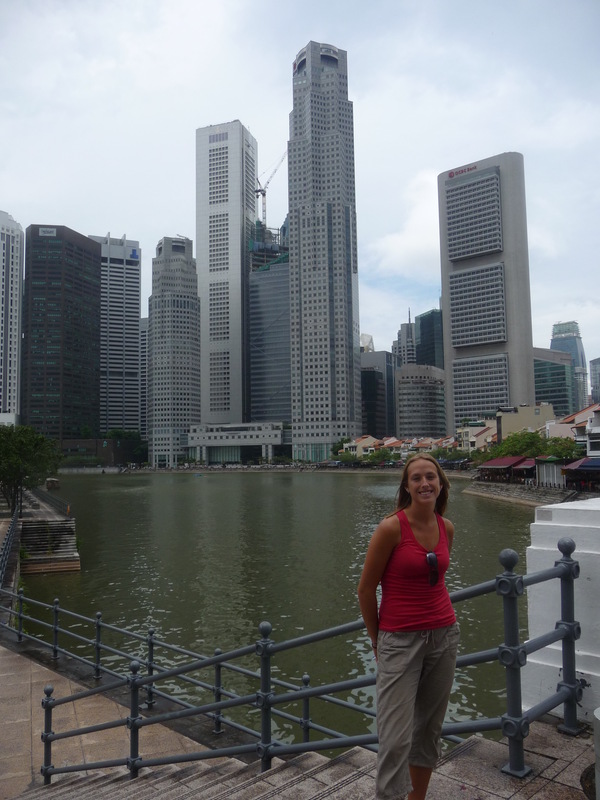 After staying in Jakarta for a few nights on a long layover, we flew to Singapore to check out the city for five days. 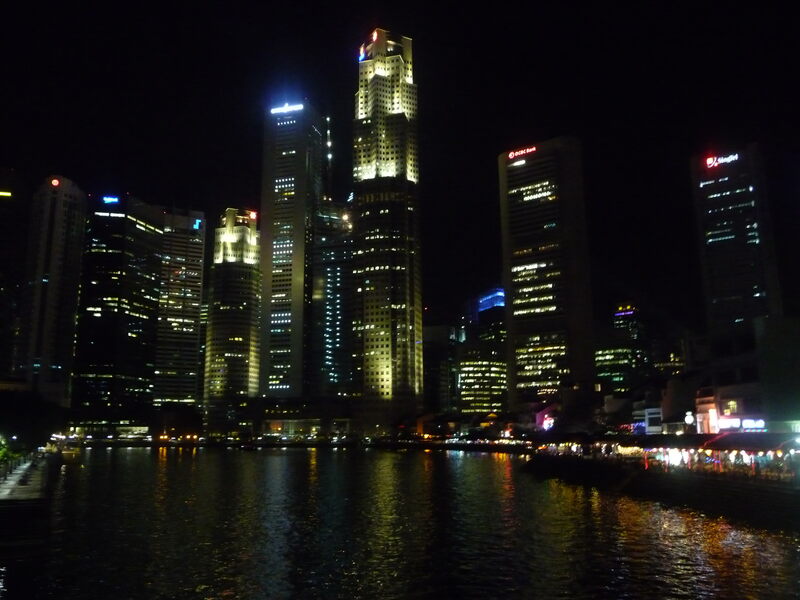 Because of the expensive cost and the small size, it had never been a top SE Asia destination for either of us, but our flights back into Malaysia worked out best through Singapore so we thought we would see what this financial hub had to offer. 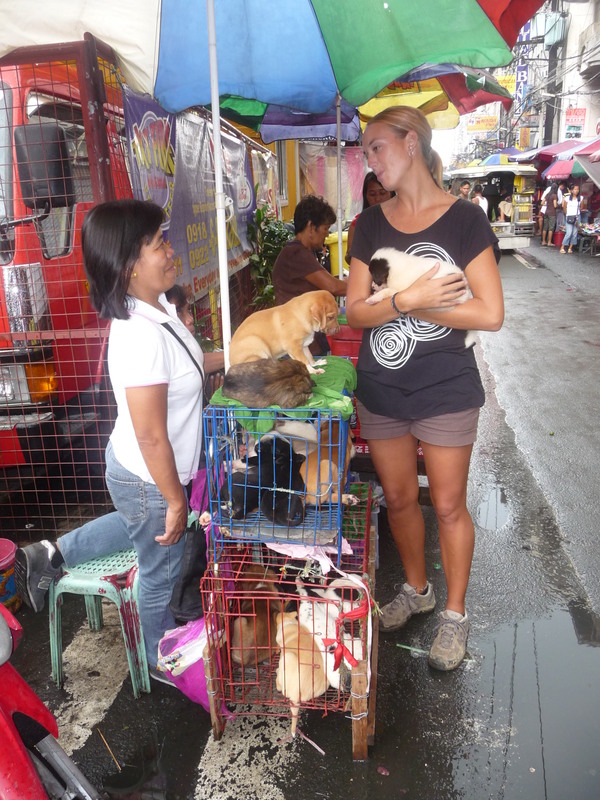 The first thing that struck us was just how organized and clean the city was, especially after coming from Indonesia. Not one speck of trash was anywhere on the ground or in the subway tunnel. Actually eating and drinking anywhere near the subway tunnels or on the train was strictly forbidden. Because of how clean it was, it made it a very pleasant place to walk around and wander the city. 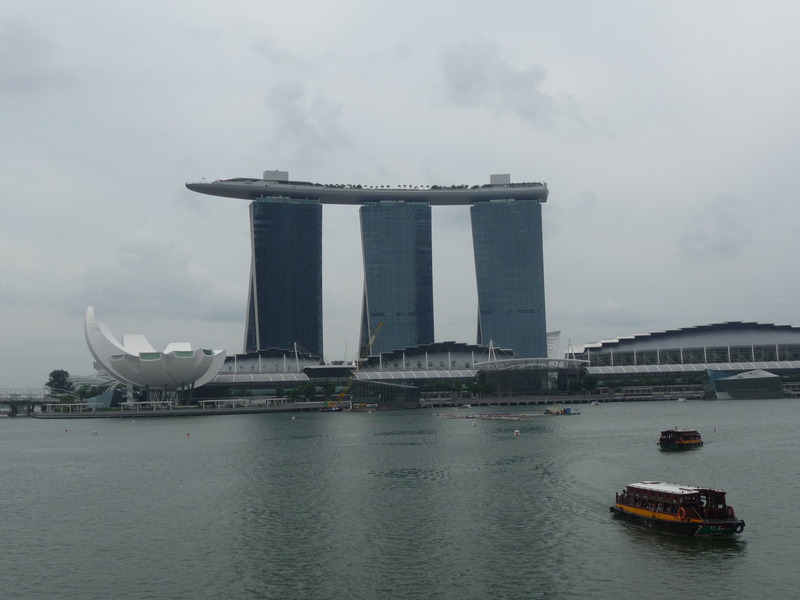 There are not many major “sites” to see in Singapore, the draw is just the city itself and we ventured out to see what we could make of it. Staying in the city center the first few nights, we spent our days walking the streets checking out Little India (in search of some good Indian food), the Arabic Quarter, Chinatown and then down to the Clarke/Boat Quay riverfront area. The riverfront actually reminded us somewhat of Chicago with bars and restaurants lining the picturesque river and tall sky scrapers off in the distance. We tracked down a brewery along the riverfront serving the first speciality draft beer we had seen in a long time. So sick of drinking lager, we sat down to enjoy a $30 pitcher of IPA. Yes, it was very expensive, and yes, it was worth it! Since we spent most of our budget on our pitcher of beer, the rest of our time was spent eating and drinking at the local food (hawker) centers. 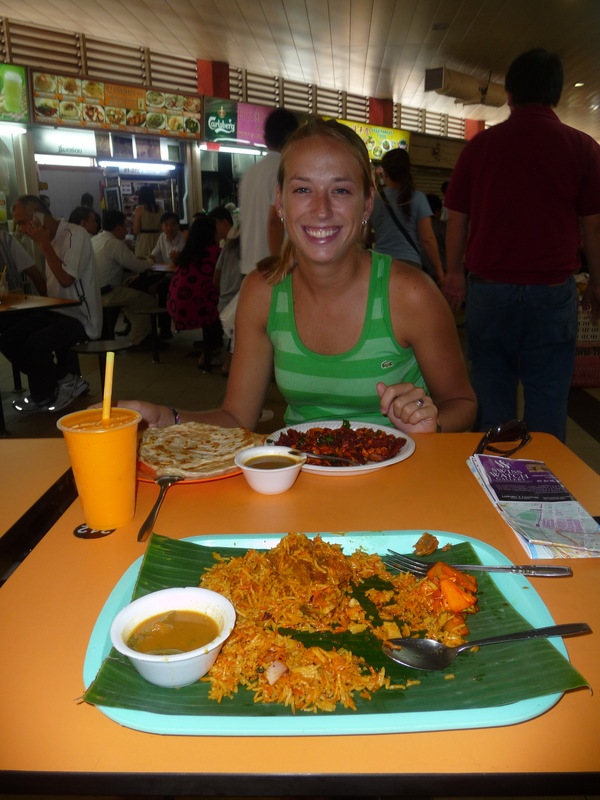 Around most corners, you can find large eating areas with 50 or so stalls all selling a variety of Asian and Indian dishes, it is a great place to get a good, cheap meal and the best place to find cheap (which is still expensive!) 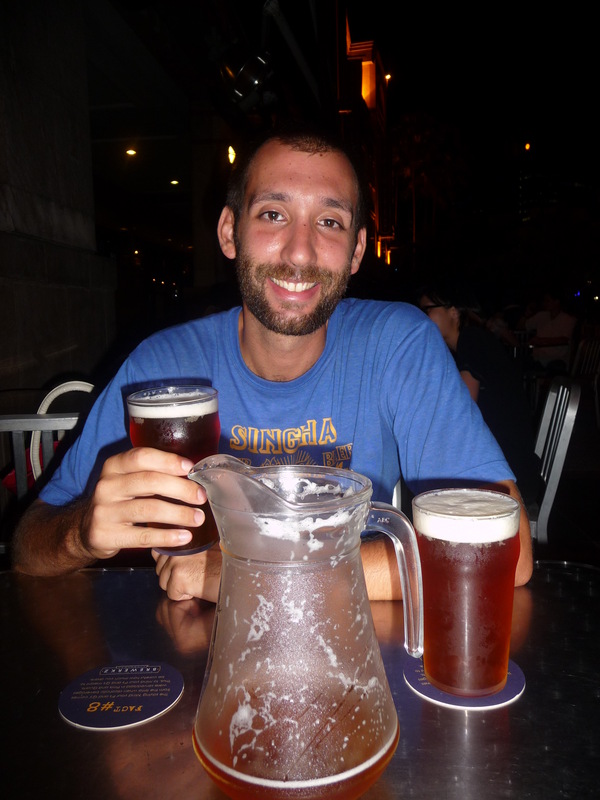 beer in Singapore. One our second day we woke up excited and anxious to check out of our hostel. Becky’s father was able use some of his Hilton points to put us up at a nice hotel for the last two nights of our stay to celebrate Jason’s birthday (again!) as well as our one year travel anniversary. We were able to walk to the hotel from our hostel and when we showed up, we could tell we did not quite fit in with our casual clothes and big backpacks. This hotel was five-star all the way. The concierge immediately asked if he could take our bags, we politely said no thank you but he continued to follow us to the reception desk and started chatting with Jason as we checked in. When we finally made it to our room, it was of course fantastic. After one year of staying in $10/night budget hotels with squat toilets, cold showers and hard beds, the Conrad Hotel was a fabulous change. We made sure to make use of all the amenities it had to offer, Becky swam in the pool, Jason used the fitness center, we rented DVD’s from the gift shop to watch on our flat screen TV and we relaxed in style in the hotel robe and slippers. To make our stay even more wonderful, Jason had mentioned to the concierge that we had been traveling for one year and after coming back up to our room, the concierge had sent a $150 bottle of champagne with a nice note congratulating us on our year of travel. It was only 1 pm, but it was of course never too early to start drinking champagne! Soon after, we had a visit from a friend who we met in Indonesia who was traveling through Singapore on his way back home to The Netherlands. He stopped by our room just in time to share in our mid-day champagne drinking. We spent the rest of the afternoon wandering the streets a bit more with him and visiting some other areas of the city neither of us had seen yet. 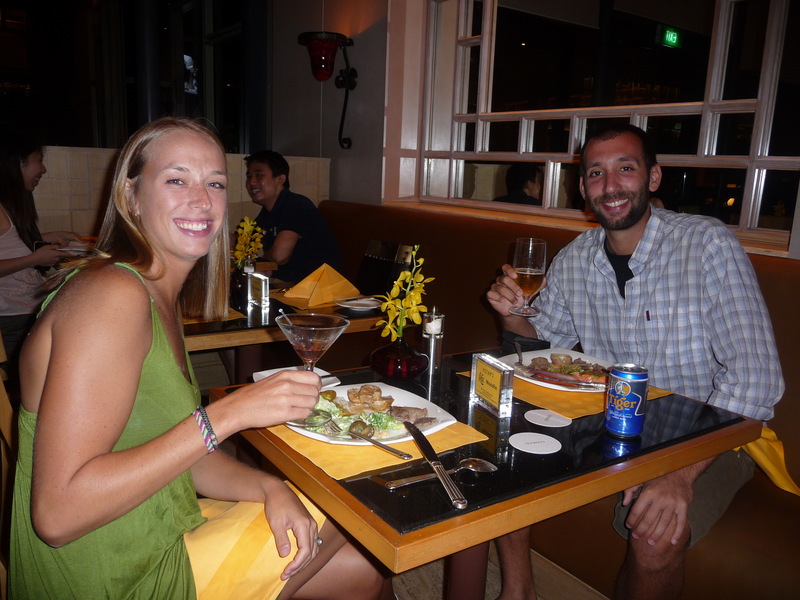 On our final night, thanks to Becky’s parents, we were able to treat ourselves to a nice dinner at the Conrad hotel restaurant. Since it was buffet style, we planned accordingly and went to dinner good and hungry. Jason stuffed himself with as much raw fish as he could stomach while Becky couldn’t stop eating from the cheese tray. It was one of the best meals we have had on this entire trip and a wonderful way to spend our one year travel anniversary. Thank you Mom and Dad for making our Singapore stay a wonderful one! Sleeping in a hostel dorm bed our first night, we remember now how much we have started to hate sharing a room with other people, we are becoming ‘flash’packers.